My early family research had uncovered that William Robson, my great grandfather had married Annie Robertson Kippax, and this quickly led to the discovery of Annie’s parents as William Henry Kippax born on 29 March 1827 in Windsor, New South Wales and Elizabeth Whitton Robertson born about 1833 in Dundee, Scotland. 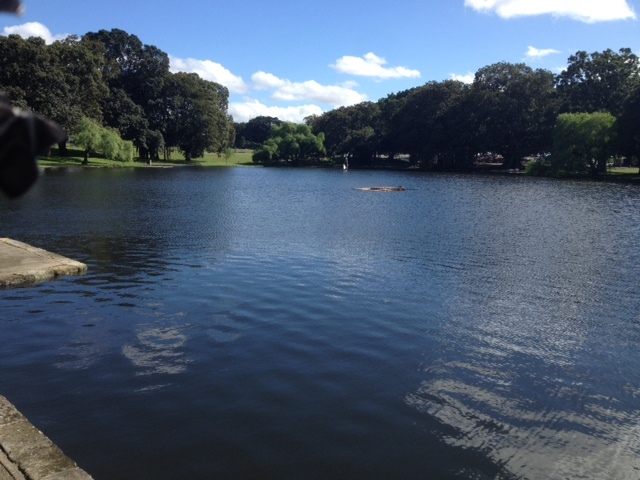 The Robson Family of Wollongong are another family chapter that I have written up previously. Another chapter will deal with The Robertson Family of Dundee. 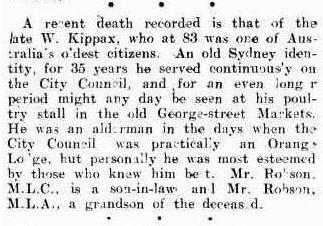 The name Kippax was familiar to me, and some of my earliest remembrances of my father, Reginald George Robson was when he would tell family stories about our earliest Australians. 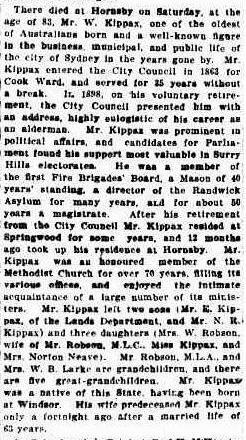 He was very proud of his Kippax ancestry, and explained that Kippax Street in the city was named in honour of his great grandfather William Kippax, who had served on the City of Sydney Council for many years. He had also told me that I was a sixth generation born Australian. I had assumed this was from my Robson line, however it soon became clear that the Robson family had not arrived in Australia early enough for this fact to be correct. Then, late on a hot January night in 2011, and unable to sleep, I resumed my research and reached in the dark for my lap top, and decided to explore my Kippax line. 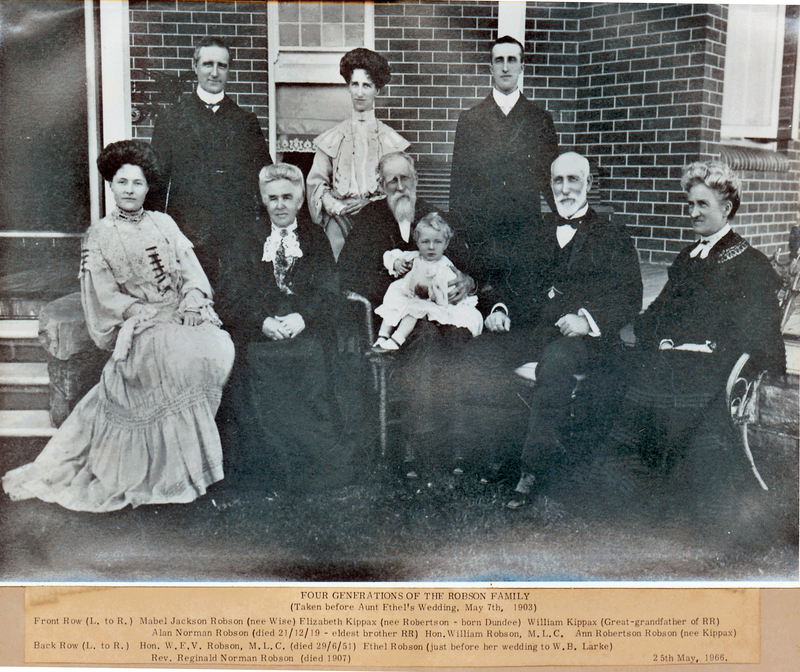 William Kippax and Elizabeth Robertson married in 1849 and had eleven children. Two children, Elizabeth and Frank, died as infants, and Walter and Kate, were barely adults before they were struck down by illness. Only their eldest Annie (Robson), and youngest Elsie (Neave) married, and produced families. Two sons William Henry Jnr. and Edwin married but had no children. Eliza, Lizzie and Norman never married. 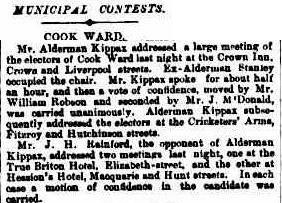 Archives at Sydney City Council state that William Kippax was Alderman for Cook Ward from 1 December 1863 to 30 November 1898. 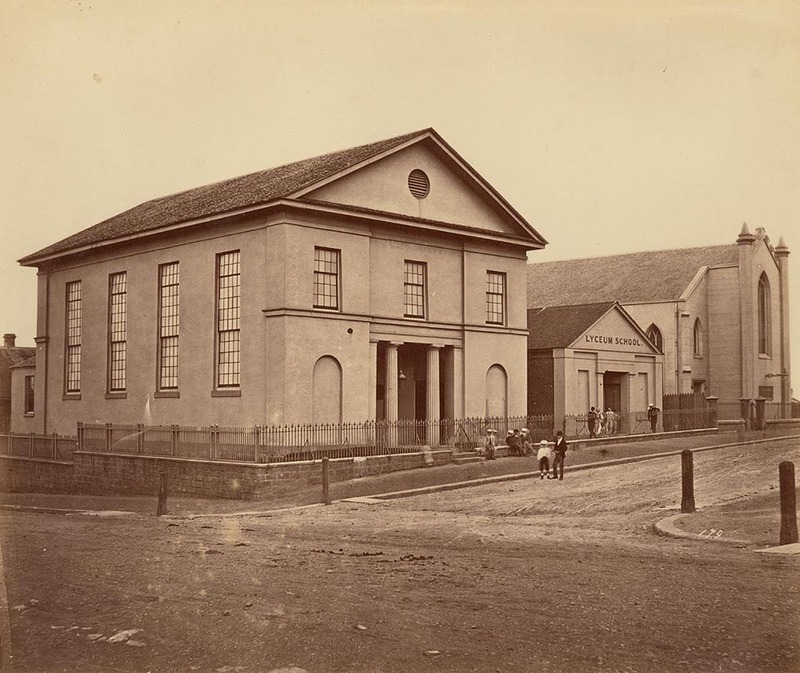 Photograph by Charles Percy Pickering of The Sydney Baptist Church, The Lyceum School and St Andrews Presbyterian Church (far right), circa 1879-72 This image courtesy of State Library of New South Wales – the Pickering collection is lodged with the Mitchell Library. St Andrew’s Presbyterian Church is no longer existing, and it would seem it was built adjacent to St Andrews Cathedral which is on the corner of George and Bathurst Streets. The Old Sydney Burial Ground is now the site of the Sydney Town Hall after the land was resumed and the main burial in Sydney was moved to Devonshire Street in the city. Today this is the site of Central Railway. A few years ago, the Sydney Town Hall was renovating an area underneath the south side of the building, when an excavators discovered the remains of part of the Old Sydney Burial Ground, today this area can be accessed during guided tours of the building. 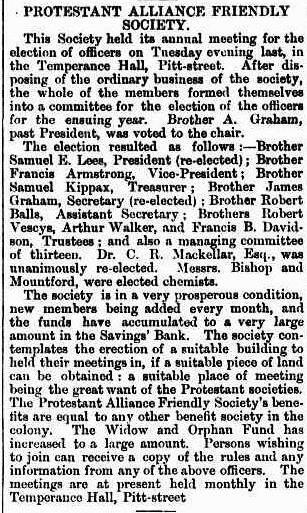 Whilst researching old Sydney newspapers on Trove, the Australian National Library website I found a clipping from the Sydney Morning Herald celebrating the golden wedding anniversary of William and Elizabeth Kippax, stating that they were married at St Andrews Presbyterian Church, Sydney, by Rev. Dr. McGarvie (image is reproduced later in this chapter). However, it most confusingly states the date as 26 March 1898, which is clearly a year different to the Australian Marriage Index I collected. The same year that William and Elizabeth married, William established a poultry business at the Sydney Markets, hence Market Street in the city. The site for the old markets is now the site of the Queen Victoria Building which takes up an entire block in the city. 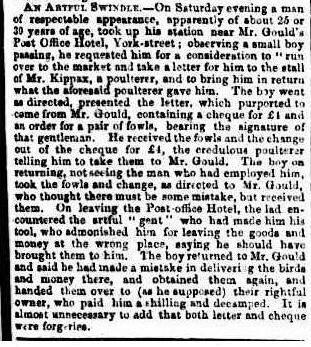 William and his brother Samuel soon set up a poultry business together and some interesting reading in old newspapers and police reports show that there was a continual need for them to be street wise about some of the activities happening around the markets. 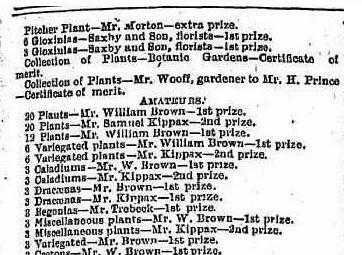 William and Samuel both became civil minded and their activities, which included business and political representations and religious activity, Samuel even won medals for showing his flowers at the Royal Horticultural Society, marking them as respected and model citizens of their community. In 2012 I connected through ancestry.com messages with Nicola Paul, and we decided to meet together at the State Library of New South Wales for a day of Kippax family research. During that day I ordered this family tree which has been lodged at the Library and unfortunately it is unsigned which is so disappointing. It mentions so many of my extended family including my parents Reg Robson, the son of W.E.V Robson and my mother Vena Fuller and includes my brother William “Bill” Robson. 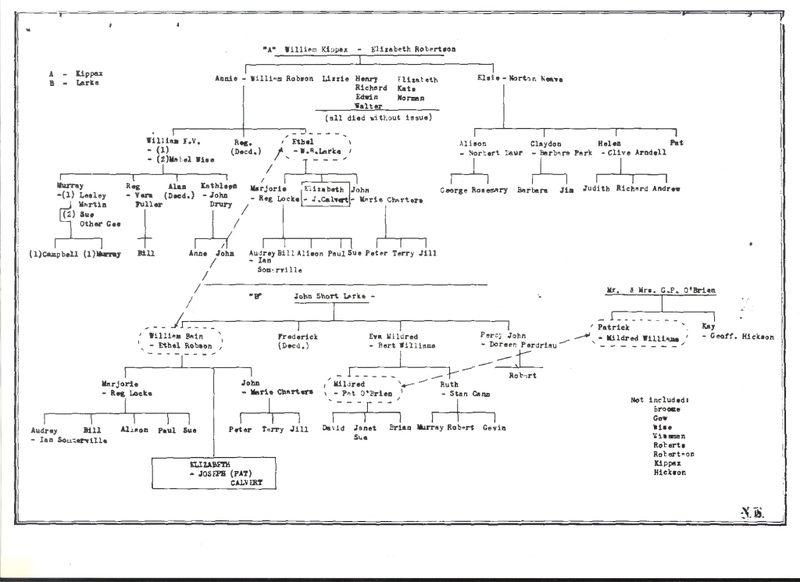 I can only suggest that since my brother was nine years older than me, that this family tree was authored in the early 1950’s. 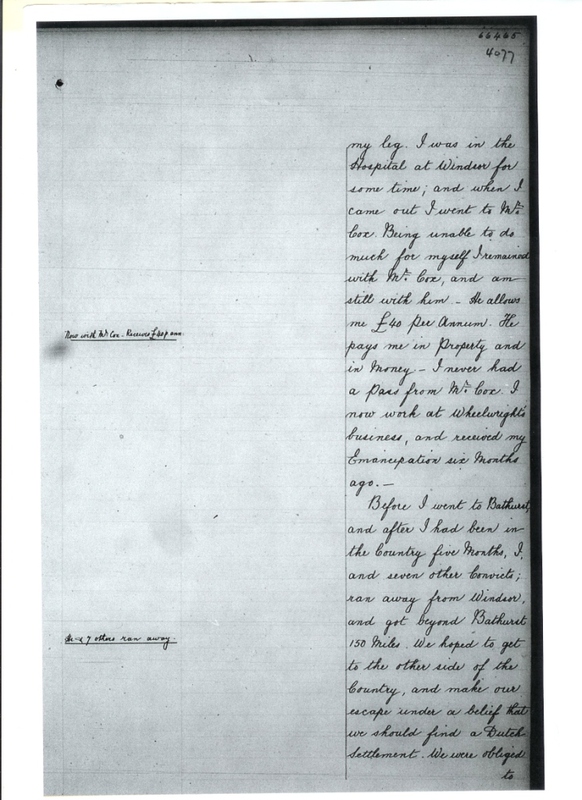 It was during this visit that Nicola and I accessed Commissioner Bigge’s Report of 1822, a report about the Colony of New South Wales to access the verbal transcription of our ancestor in common, Richard Kippax, the father of William Kippax who heads up the family tree together with his wife Elizabeth Robertson. Nicola Paul is an extremely talented researcher and I am grateful to her for her very kind generosity in sharing many of her records with me. On a visit to Rookwood Cemetery with my sister Lavinia Chrystal we photographed many of the Kippax and Robson family graves and when Nicola explained that she was related to Richard Kippax, a brother to William Henry Kippax, I told her that there was a lovely grave at Rookwood dedicated to her family. Nicola told me she already knew about it and I was able to tell her about a tree that was growing alarmingly beside the grave and would soon start to topple it, as it was a camphor laurel tree. I told her that I had approached the Anglican Office and filled in a report about the grave, and had engaged and paid their gardeners to cut the tree out. I know how pleased she was when I told her this news. A visit the following Spring allowed me to photograph all the grave panels and shields that had previously been covered by the tree. 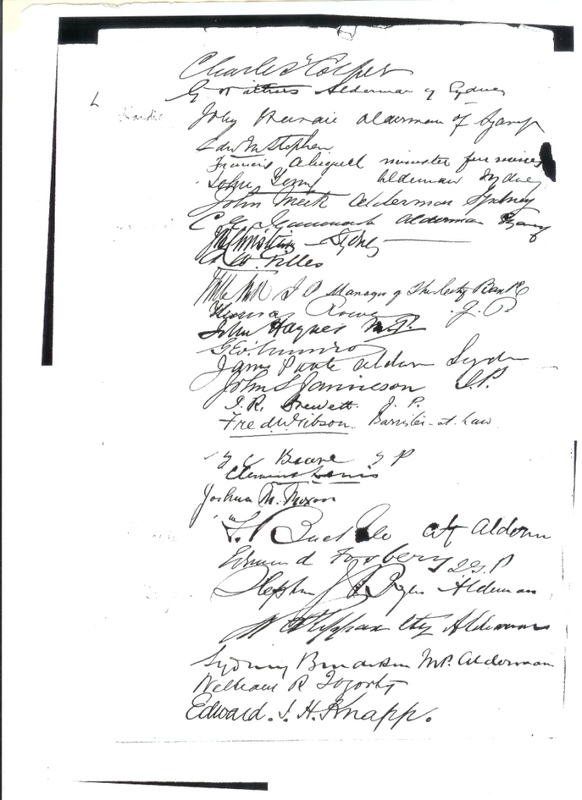 William Kippax signed this document (2nd page) along with some most famous figures in Australian History including the signatures of Sir Henry Parkes and Sir Edmund Barton. 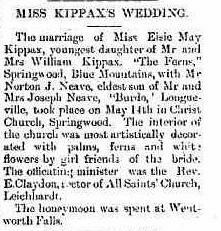 Golden Wedding Anniversary of William and Elizabeth Kippax, Sydney Morning Herald, 26 March 1898. William and Elizabeth were married at St Andrews Presbyterian Church on 26 March 1848 by Rev. Dr McGarvie. 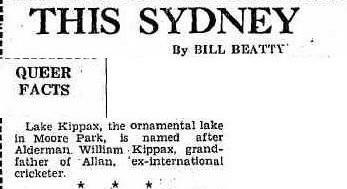 I found this snippet from The Sun Newspaper and it is regarding the error often made that Lake Kippax, opposite the Sydney Cricket Ground was named after the famous cricketer, Allan Kippax, and compounding another error, as William Kippax was actually Allan’s great uncle. It was touching to see and photograph this headstone and realise that William and Elizabeth died within a few weeks of one another in April 1910. William and Elizabeth had a large family of eleven children, and it is a surprising fact that only two of their children were to give them any grandchildren. These two children were their eldest daughter Annie Robertson was born in 1850, who married William Robson Jnr, and their youngest daughter, Elsie who was born in 1874, who married Norton Joseph Neave. An incredible fact was that in 1869, when Elizabeth Kippax was pregnant with Kate Kippax, her daughter Annie Robson was pregnant with my grandfather W.E.V. Robson. Elizabeth Kippax went on to have two further children Norman 1871 and Elsie 1874, and Annie had two further children, Ethel 1872 and Reginald 1878. My grandfather W.E.V. Robson was a close friend of Norton Neave and his son Reginald Claydon Neave, both sat on the board of Larke Hoskins with W.E.V. Robson. 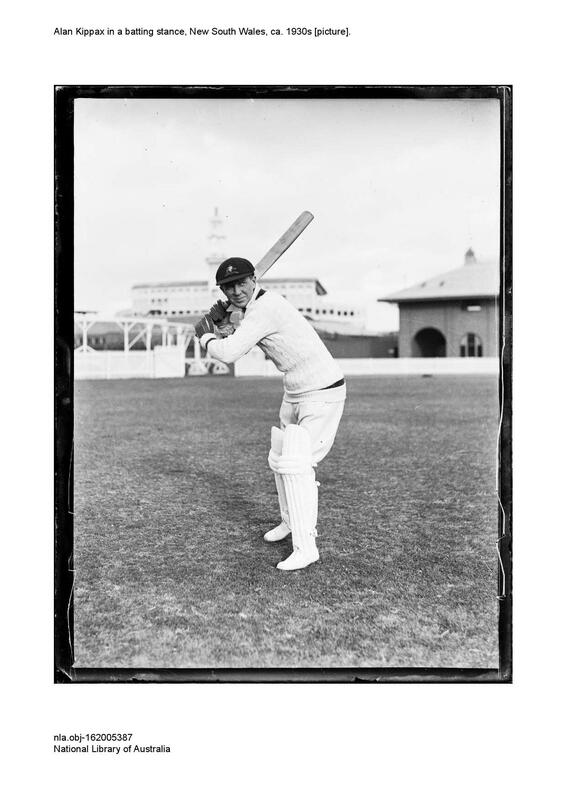 Samuel was named in honour of his maternal grandfather Samuel Howell and he was also the grandfather of the famous cricketer Alan Falconer Kippax who was the son of Arthur Percival Howell Kippax. It was nice to see that Samuel was naming his children after his ancestors. Alan was given the middle name Falconer in honour of his Scottish grandmother’s maiden name, Jane Duncan Falconer, who married Robert Robertson. The Robertson’s migrated to Sydney, Australia, aboard the Scottish migrant ship, The Lady Kennaway. The Robertson’s daughter Eliza Waugh Robertson was born on 1 May 1938 in the Bay of Biscay, on the vogage, and her middle name Waugh was given in honour of the ship’s surgeon, Dr Waugh who delivered Eliza. Brothers William Henry Kippax and Samuel Kippax married two Robertson sisters, Elizabeth and Eliza Robertson, and The Robertson Family of Dundee will be another family chapter in my family history as I endeavour to take the family back to Scotland. 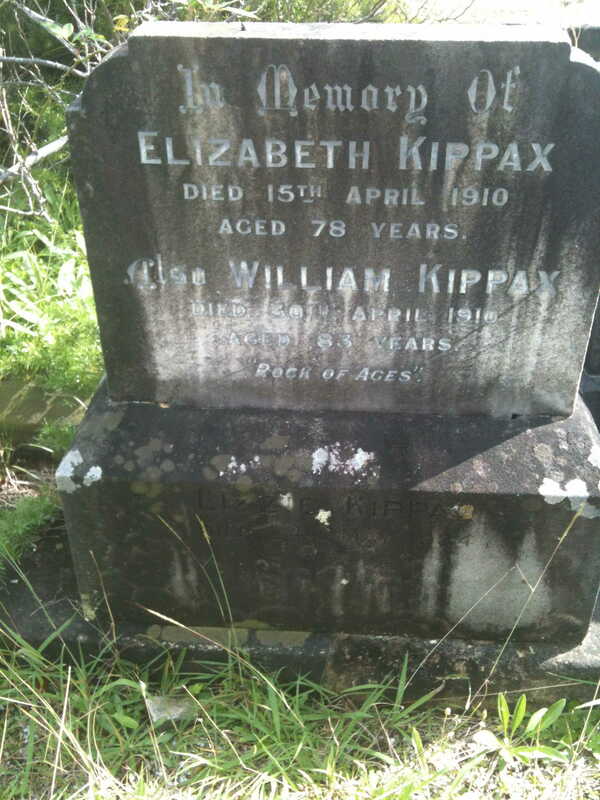 Grave of Samuel Kippax and his wife Mary and several young children, Rookwood Cemetery. It was surprising to find Samuel’s grave unmarked by a headstone and the headstone in the photograph marks another grave behind. 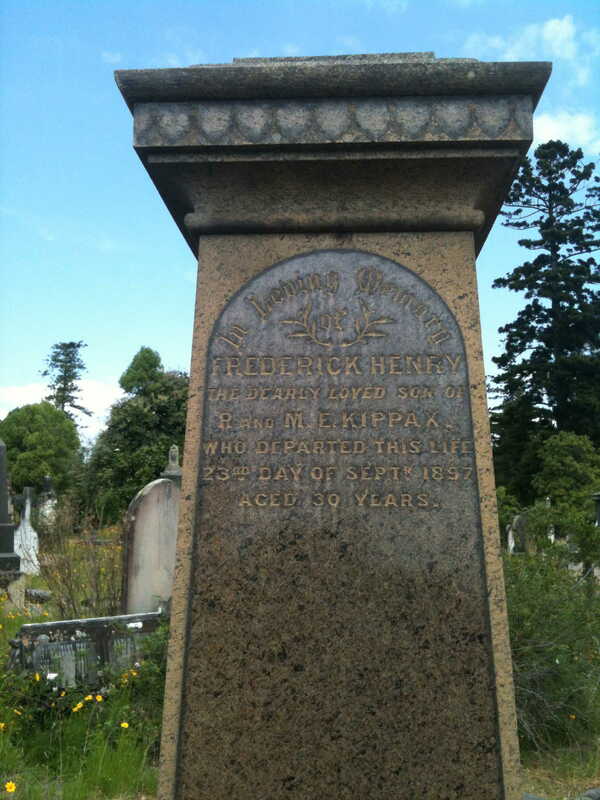 Richard Kippax Jnr 1832-1903 Fact Sheet, brother to William Henry Kippax. 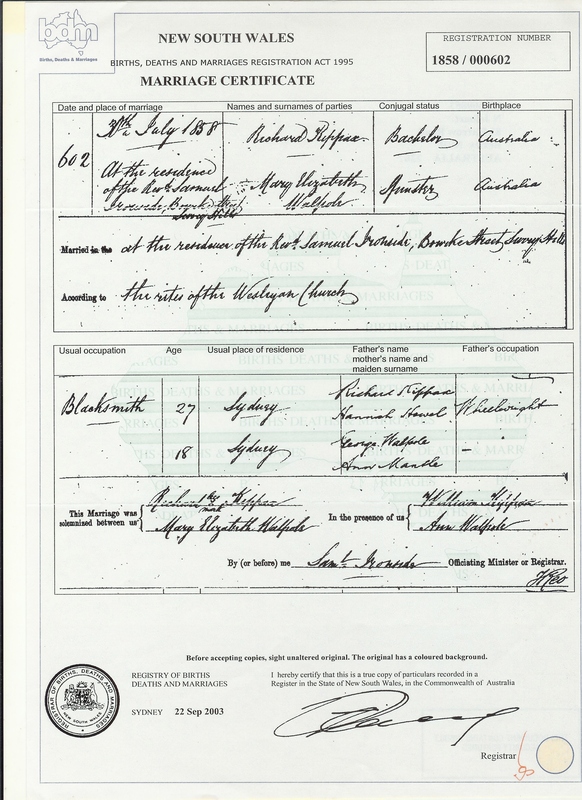 Marriage Certificate for Richard Kippax and Mary Elizabeth Walpole who married on 30 July 1858 according to the rites of the Wesleyan Church, Witnessed by William Kippax, Richard’s elder brother, and Ann Walpole. Certificate kindly provided by Nicola Paul. Headstone shield telling the heartbreaking and poignant story of the loss of Richard and Mary Kippax’s son Horace in a boating accident aboard the Irene on Sydney Harbour in October 1889. It is such a heat rending death notice and one can only image what a sad Christmas that Richard and Mary Kippax must have spent mourning the loss of their 21-year-old son. Another heartbreaking poem from Richard and Mary mourning a beloved son, Fred. A few weeks earlier I had joined ancestry.com in a quest to discover more about my ancestors. I was dubious at first that I would be very successful, however not even in my imagination could I have envisaged the new world that was about to open before me. 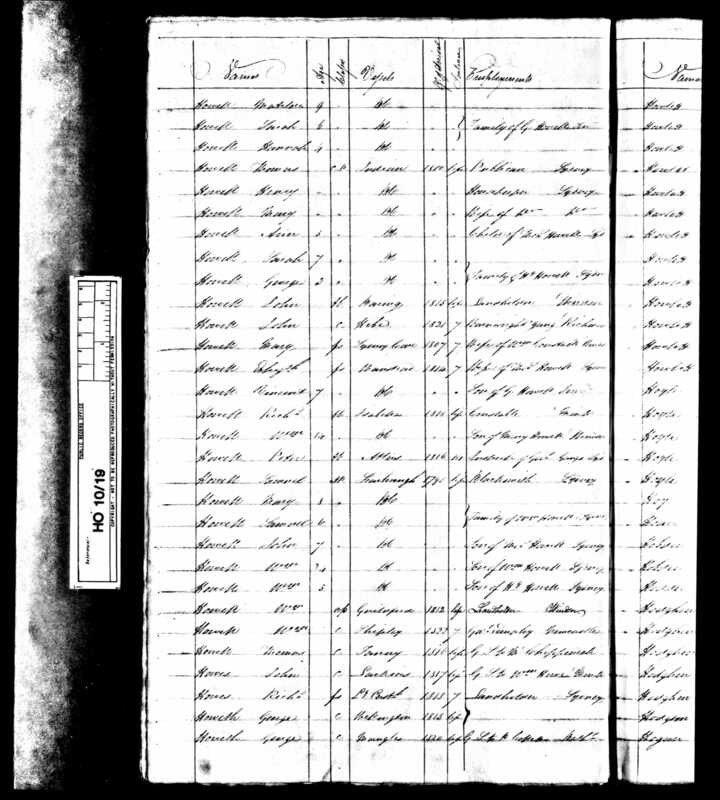 When I keyed in the names Hannah and Richard as the parents of William Henry Kippax, I immediately discovered that a family story already existed about William’s mother Hannah Howell on the ancestry.com website. I collected the information to my tree determined to find out more. “The death of Mary Ann Howell M’Grath identifies the relationship to Hannah Howell (Dean Kippax Thorogood) and Samuel Howell. 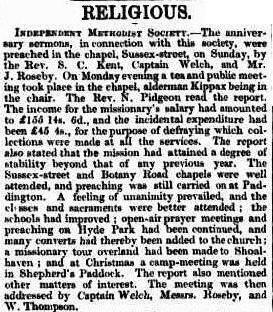 I was then determined to find the original newspaper clipping of this entry, and searched Trove Digitised Newspapers for it, and found a similar entry from the Evening News. 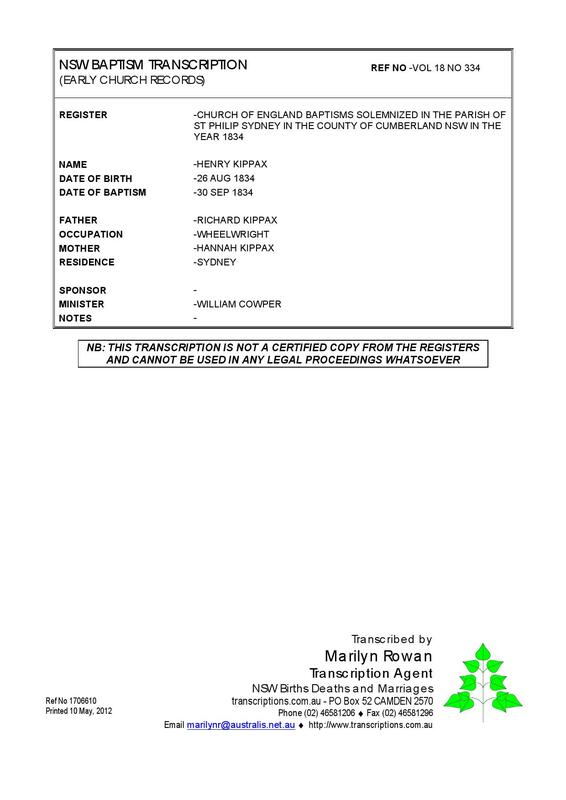 No birth record for William Kippax was available for me to collect however I studied several family trees with great interest before accepting any records to my tree. 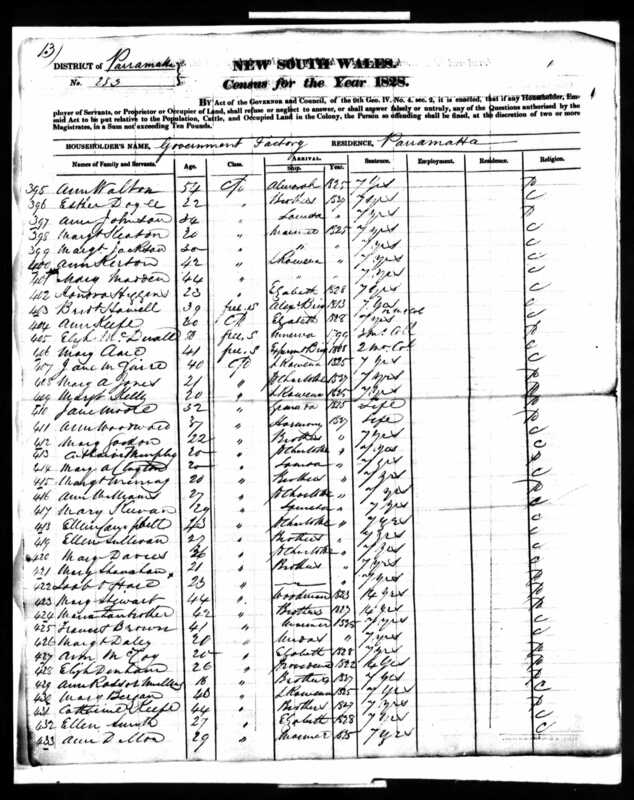 Another interesting document placed on ancestry was the death certificate for Hannah giving her age at 76 years. 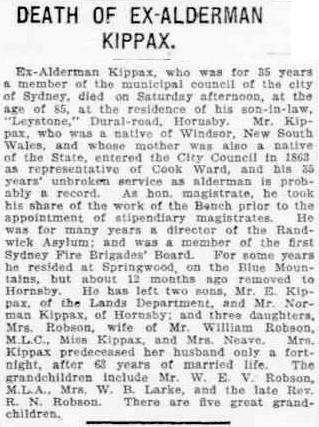 No information here was forthcoming regarding her previous marriage to Richard Kippax, but I then found Hannah’s death notice, after a quick search on Trove Digitised Newspapers, which confirmed her as the mother of William Kippax and gave me the names of his two brothers, Samuel and Richard. I noted the discrepancies in the given ages of Hannah on her death certificate and her death notice, and without a birth record for her, I accepted her approximate age, and that she was either 76 or 72. Some quick maths placed her birth at either 1795 or 1799. How excitingly close that was to the establishment of our nation, only ten years earlier. What must it have been like to live in Sydney town in 1799? I was also fascinated to discover that at Hannah’s Inquest into her Death, the Coroner recorded that Hannah was “a native to this colony”. It occurred to me that Hannah must have been my earliest born Australian ancestor and, being my 3 x great grandmother – this accounted for my being a sixth generation born Australian. The Coroner also recorded that Hannah was the mother of seven children. 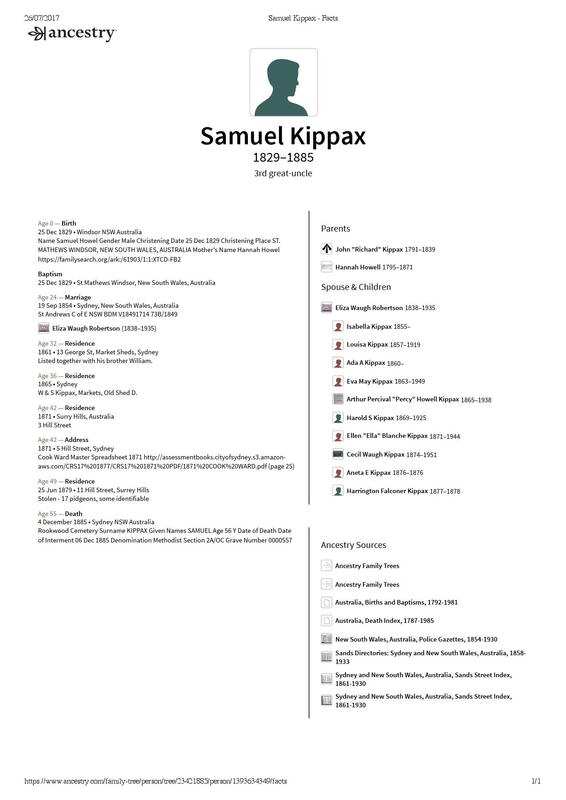 I had a lot of work in front of me to find the other siblings of William, Samuel and Richard Kippax. 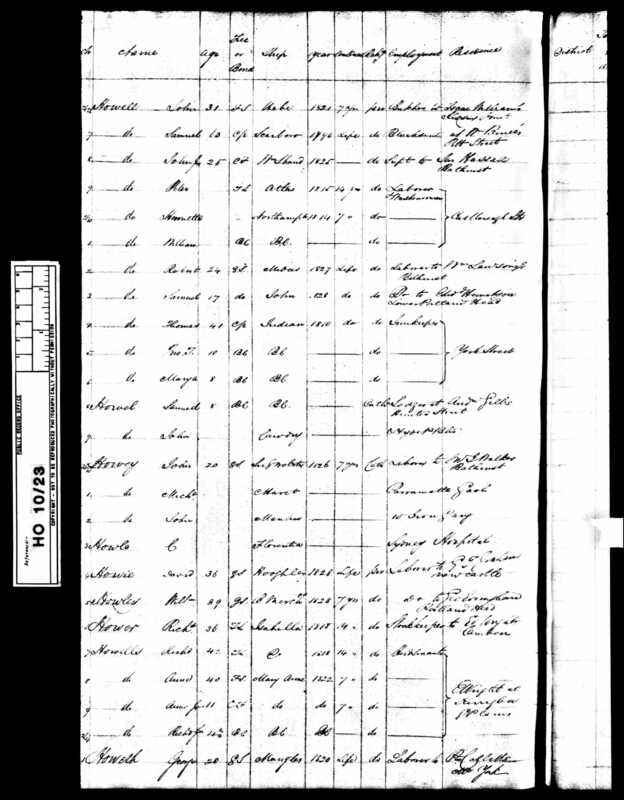 I accessed several ancestry trees that hot January night, and found many trees had a lot of information regarding Richard Kippax, and suddenly before my eyes I was completely shocked to discover that many trees had convict transportation records attached to them and they named Richard Kippax with aliases such as John Kippas from the convict ship Indefatigable. 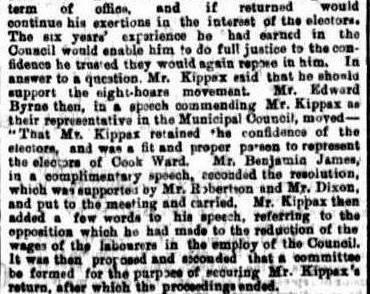 I can remember clearly that I hesitated over the “press” to show the convict record, with a mixture of excitement and disbelief making my fingers shake as I pressed the button to reveal my convict, John/Richard Kippax/Kippas. 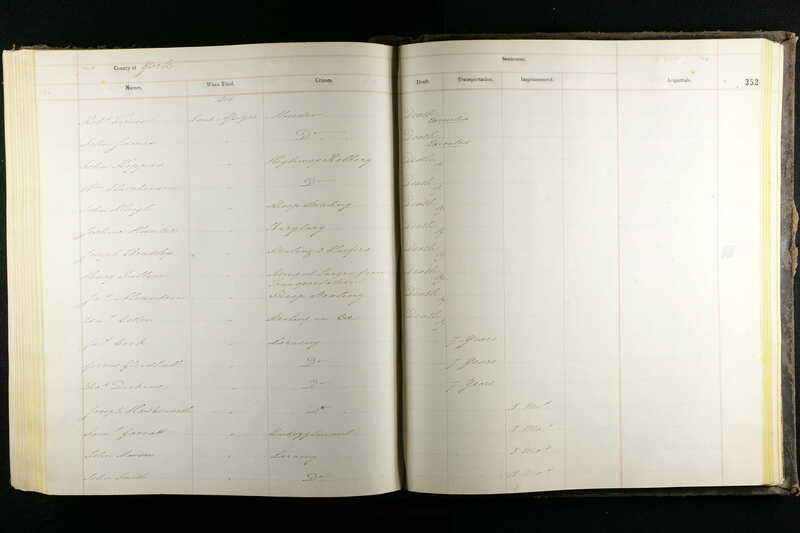 I opened a document which was titled England and Wales Criminal Register dated 1814 and unbelievably it showed that John/Richard had been convicted of highway robbery and had been sentenced to death. I was in shock, I wanted to scream out about my discovery, but in some stupid and proud way I was secretly ashamed. Oh, I had to come to terms with this. No one in my family had ever mentioned the “C” word, no one had said there were convicts in our family, my father was adamant that our Australian family were proud free settlers, that had helped form our nation. This was something I wasn’t prepared for, and I instinctively knew that this information had been hushed up and forgotten. No one had told my father about Richard Kippax and his convict past. 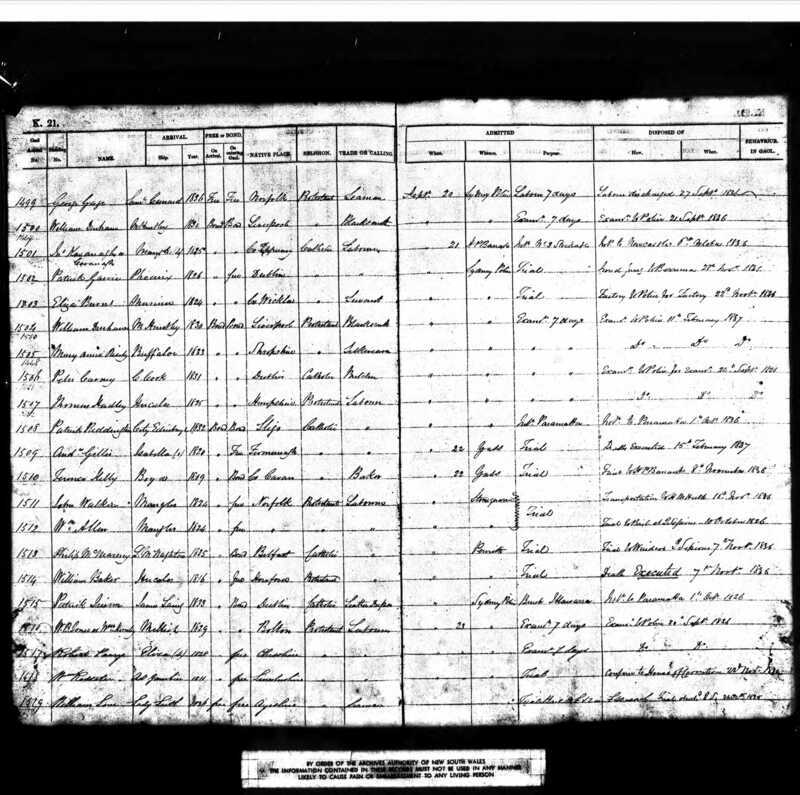 No one ever imagined that the world-wide web and computer age would deliver into my home at the press of a button the convict transportation record of my 3 x great grandfather. 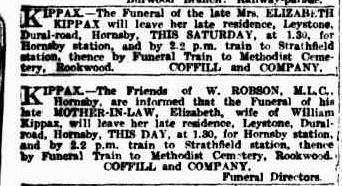 I thought about my dad’s family and his Irish mother Mabel Robson nee Wise and wondered if anyone had ever told her about a convict in the Robson/Kippax line. Having only vague memories of a fine and proper woman, I imagined if she had known, she would have never told anyone. I then started to think about what my sister was going to say tomorrow morning, when I told her what I had discovered! I was eager to only accept correct records, and it was confusing to discover that many trees had conflicting information and variously collected records for two ships, the Mariner and the Indefatigable. 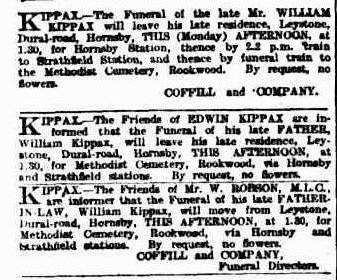 It was clear that there were two men named Richard Kippax and earlier one had been named John, and had most confusingly changed his name from John to Richard. Even today many trees have merged the two men and complications occur when family researchers are not diligent enough to read the records carefully. 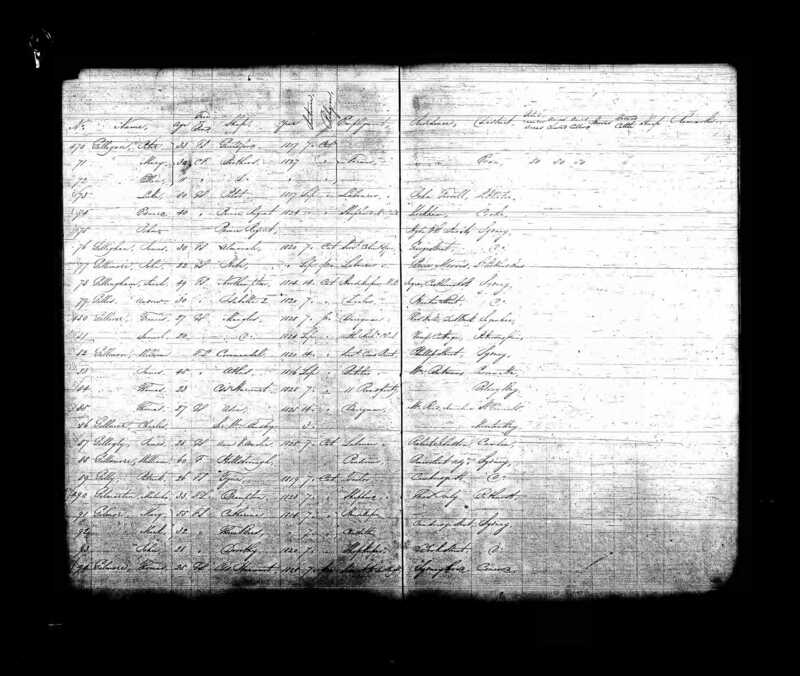 The 1822 New South Wales and Tasmanian Census was most helpful to me because for the first time I could see the two Richards listed together with their ships and quite clearly “my” Richard from the Indefatigable was the wheelwright, who had been placed into work at Windsor. The Richard Kippax from the Mariner had been placed in work at Appin as a tree lopper. Most confusingly both had arrived at about the same time. 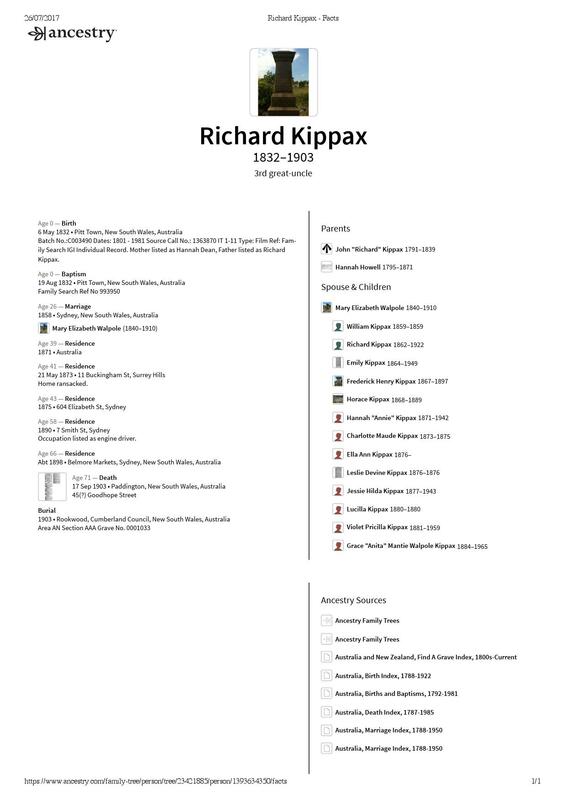 To help other ancestry family trees I placed a story into my tree on 23 May 2011, explaining the confusion regarding the two men named Richard Kippax. 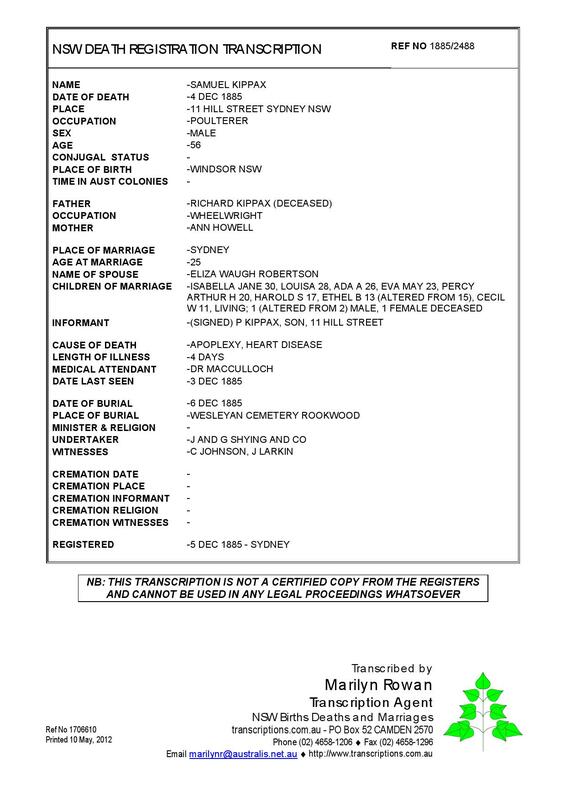 The information regarding Richard Kippas of the Mariner conflicted with other records I found on ancestry.com showing that Richard Kippas arrived in Sydney on board the Indefatiguable, and, at around the same time frame. However, other records showed a John Kippas arrived aboard the Indefatiguable. 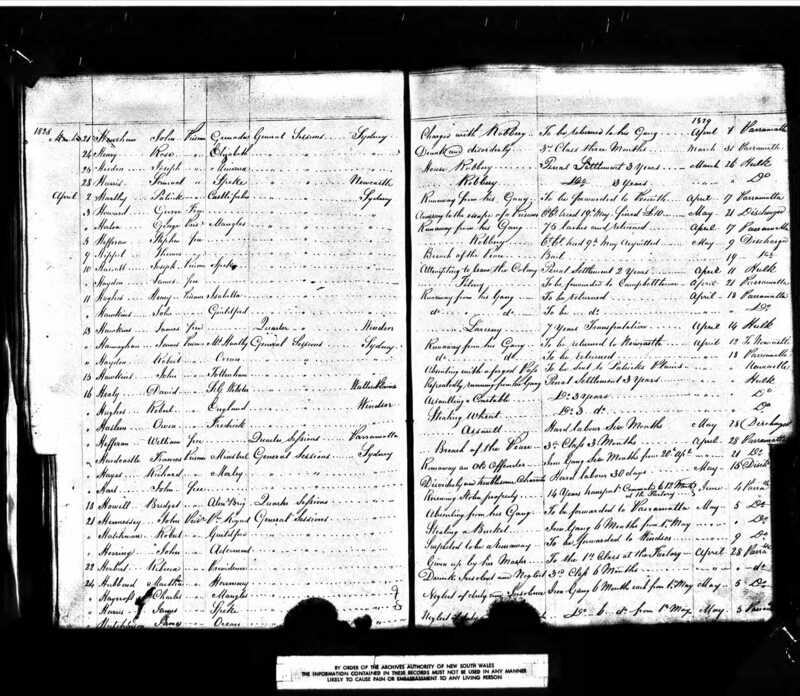 During my early research, I collected both sets of records in an effort to find out which Richard was my ancestor. I later determined that my ancestor was in fact John Kippas from the Indefatiguable, who for some unknown reason changed his name to Richard. On the same web site – www.convictrecords.com.au – I discovered this information below about John Kippas. 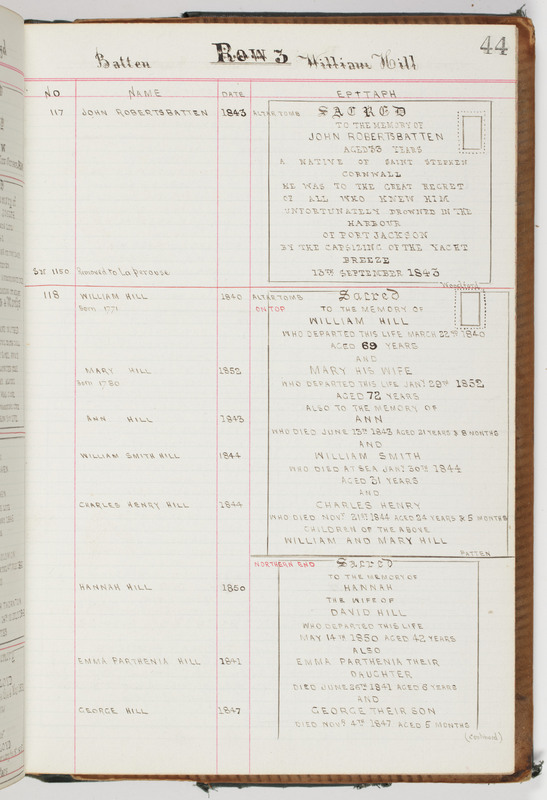 The name change is evident in the hand-written information from the General Muster of 1822, whereby Richard Kippas is recorded twice in the book, one aboard the Indefatigable and one aboard the Mariner. However, it now becomes clear that sometime around 1820, John “Richard” Kippas changed his name, from John to Richard, a fact that has caused much confusion amongst researchers. John “Richard” Kippas was a highway man from Yorkshire, and after his convictions and transportation on the Indefatigable, he was stationed at Windsor. 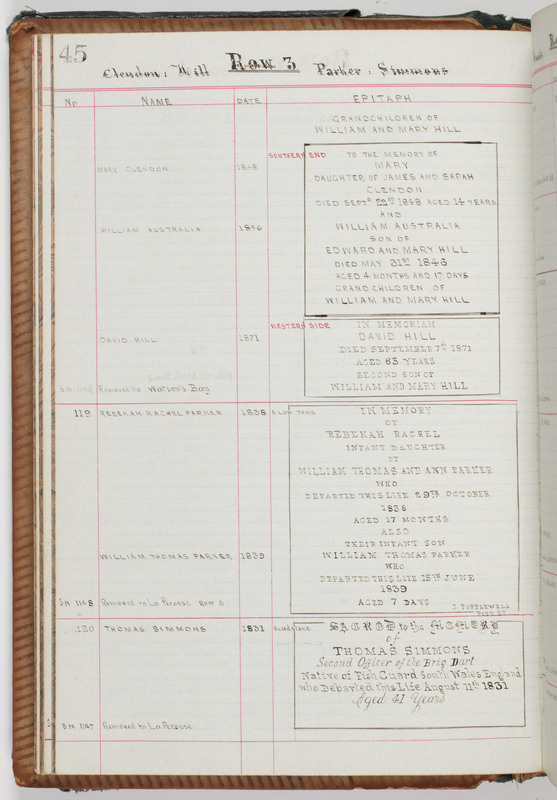 This record shows both Richard Kippas (sic), side by side, one listed as arriving on the Indefatigable and one aboard the Mariner. This record is so interesting for many reasons, firstly it is just before he changed his name from John to Richard, secondly it is Richard Kippax’s absolute pardon, just five years after his transportation. It also gives information that John “Richard” Kippax hailed from Stockpool, Chester, aboard the Indefatigable but there is most interesting information about his appearance and height, at 5ft 10 in, with a florid complexion, flaxen hair and hazel eyes. It also gave information about the date of his trial in March 1814 and his 1815 departure from England. 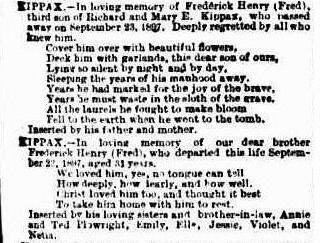 The record above is very precious because it records for the first time the solid relationship of Richard Kippax and Hannah Howell and listed is their baby son William Henry Kippax, my 2 x great grandfather on the record. It is certain that this “marriage” was a common-law marriage and that Richard and Hannah had set up not only a relationship together but were a family group. I then found two other very significant records for Hannah. 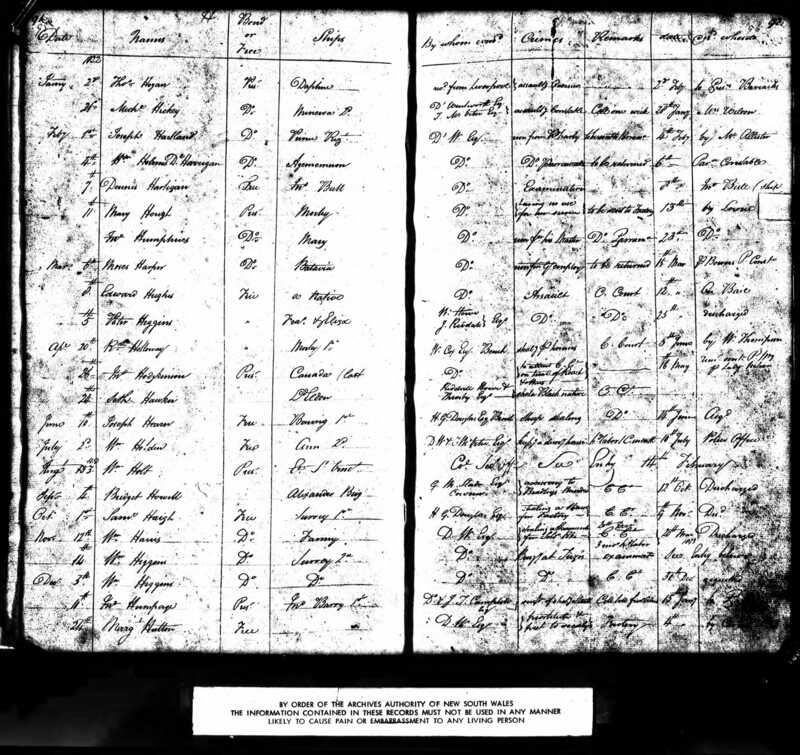 One was a marriage record for Hannah including a transcription of her first marriage to Thomas Dean, and the other an early, NSW Census from 1822. 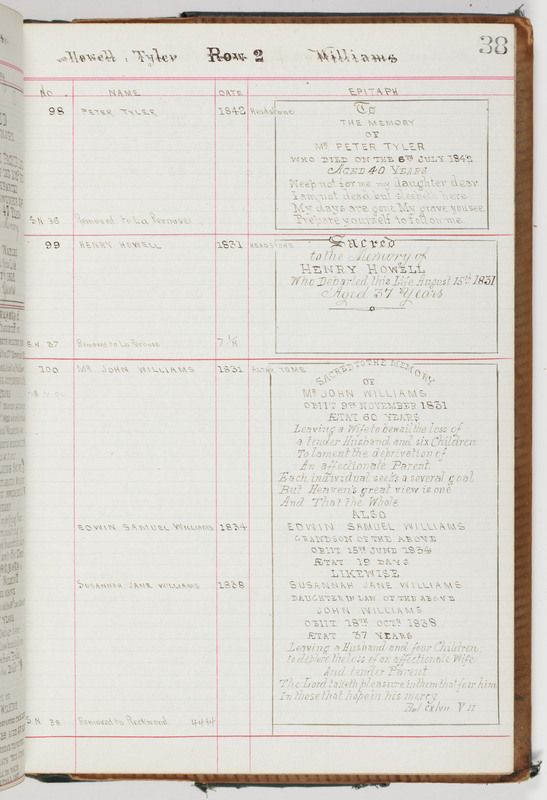 The second record was the NSW Convict Muster of 1822 which listed Hannah as Ann Dean, the wife of Thomas Dean who was also listed as transported aboard the Admiral Gambier. 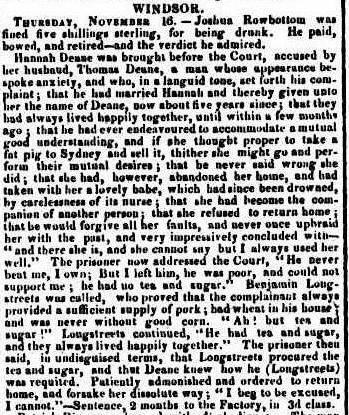 It was quite eye popping to read a newspaper article about Hannah Dean and the breakdown of her marriage and the harsh judgement given to her of two months in the Parramatta Women’s Factory. I have been able to find no records of her admittance, and wonder like other researchers whether she was pardoned from this sentence, especially as it would seem that she was five months pregnant at the time with her first child to Richard Kippax. This child would have been my 2x Great grandfather William Henry Kippax. At this stage I have been unable to find any marriage record for Hannah and Richard Kippax and assume that in 1826 they were living together in a de facto relationship. 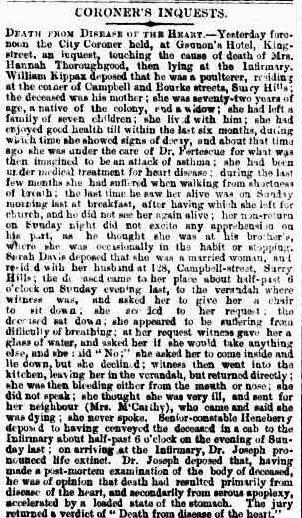 It was also sad to read that Thomas and Hannah Dean’s small son had drowned through neglect. 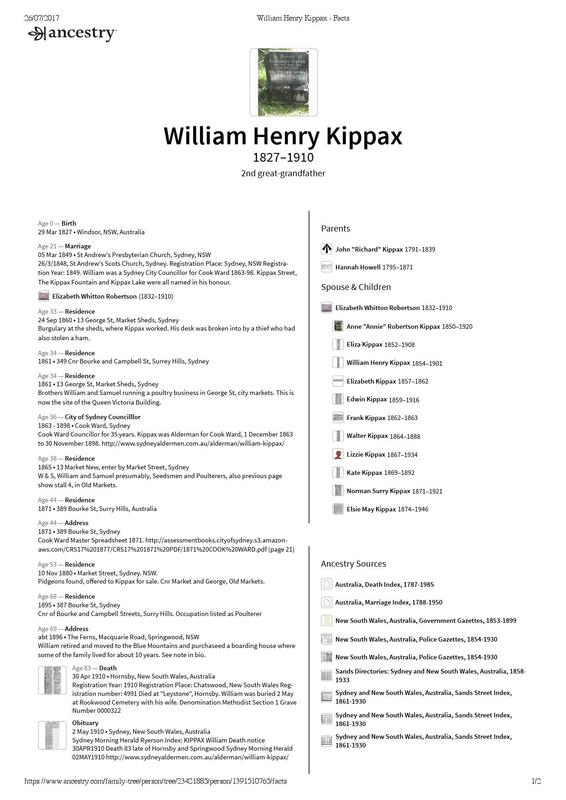 It comes now as no surprise that I can find no record for the birth of William Henry Kippax. 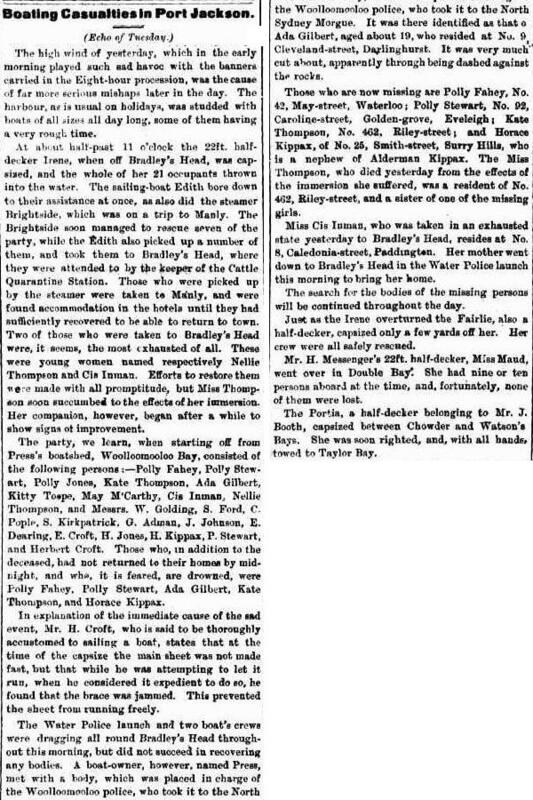 The family records William’s birthdate as 29 March 1827, which fits in with this newspaper article above, family folk law and William and Elizabeth Kippax’ headstone which is in the Old Methodist Section at Rookwood Cemetery. 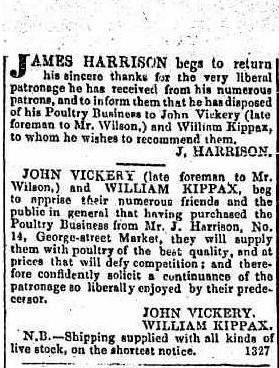 The following page show that this information from the Sydney Gazette is correct and I was able to find both the birth and death records of James, the baby son of Thomas and Hannah Dean. 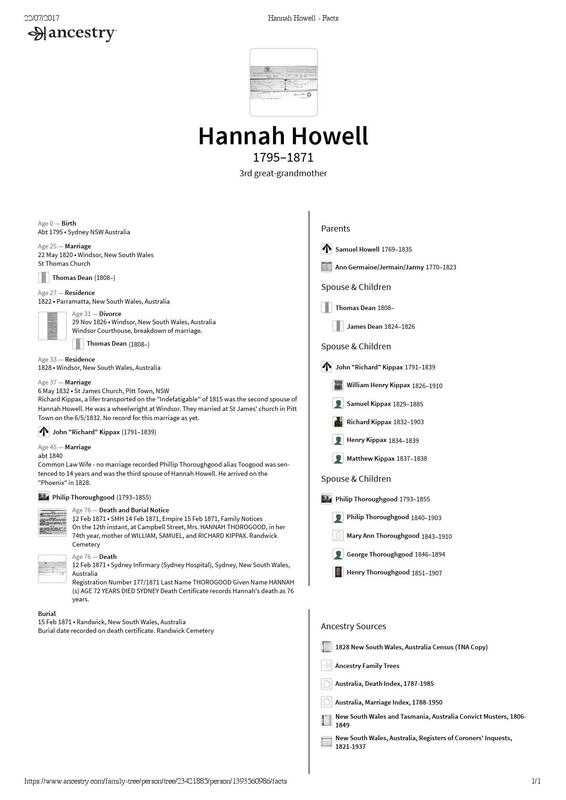 An excellent source of information came from a website I discovered quite by accident when I keyed in Hannah Howell into Google search. 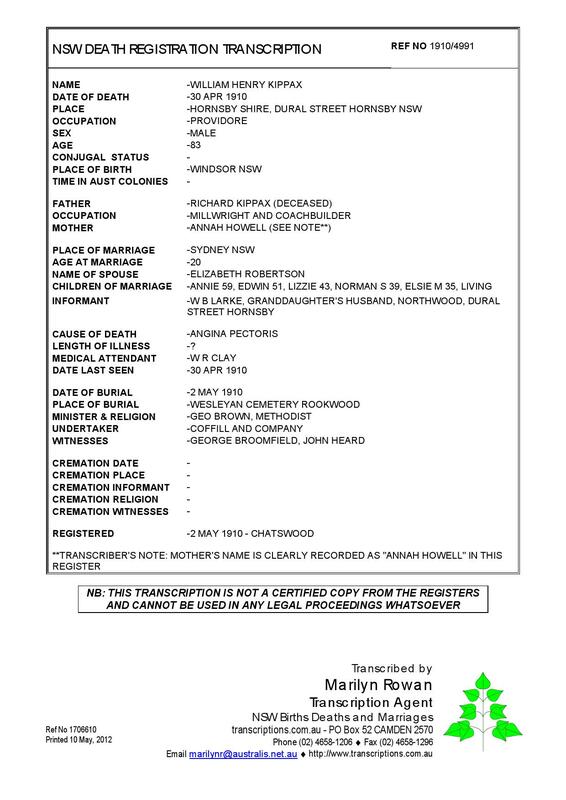 The website outlined the ancestry of the Kippax family and the Howell family and even mentioned my descent line down to my father, Reginald George Robson. It was also thoroughly supported by good references. Following the mention of a husband and child I was able to collect these two records below listing the birth and death of Hannah Howell’s first born baby. 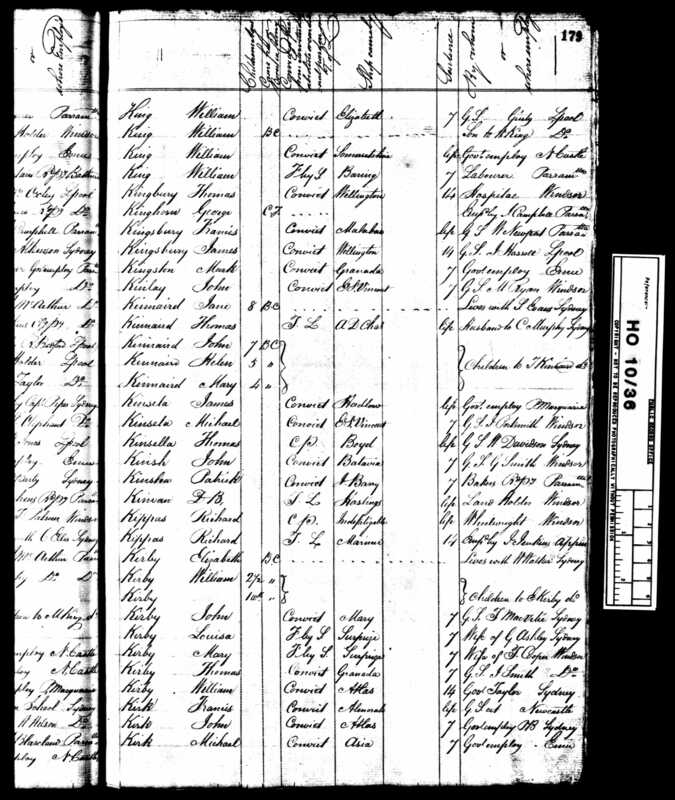 I started looking for the children of Hannah Howell/Dean/Kippax, and while William Henry Kippax’s birth record has not been found, I found several other records for William’s brothers. I was careful in collecting these records for the children of Hannah Howell, and it took me several years to confirm these as correct. What was so interesting was that with each record the information provided was so different. I then resolved to order a few records from a transcription agent and picked out Henry Kippax because the details were closest to the facts. I was probably disappointed with the information provided on this record, however Richard Kippax’s occupation as a wheelwright seemed to be correct. I was beginning to get a good idea about Hannah’s personality and had decided that she was one of life’s amazing survivors. Life hadn’t handed Hannah a silver spoon, and she had to work for everything she received in life, and I can see that she was going to make the best of her predicament. Her first marriage had been a complete failure, and it would seem she was glad to be rid of Deane in her life, then her affair with Richard Kippax was tenuous, as she had no marriage with the man. 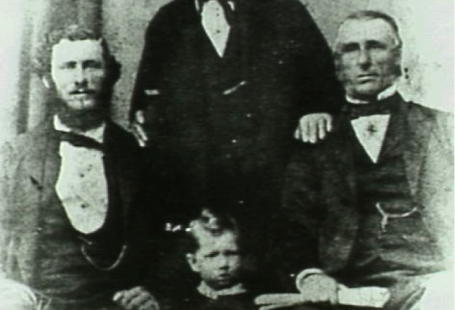 It is recorded that Samuel was born under the name Howell, and for some inexplicable reason her next son Richard was born under her former husband’s name Dean. 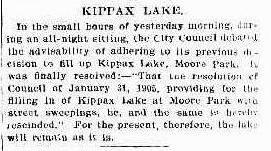 Two further sons Henry and Matthew are born under the name Kippax. 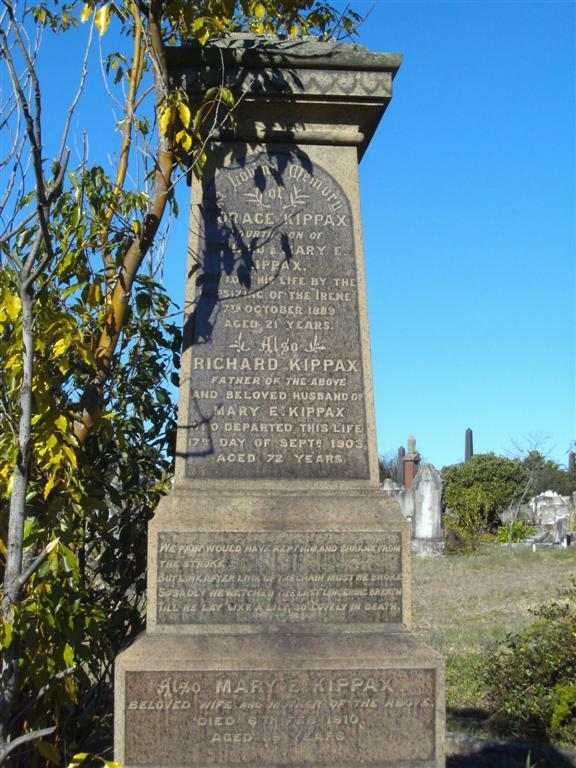 The naming of Richard Kippax as the father of Henry and Matthew is possibly supported by the apparent but yet unconfirmed marriage of Richard and Hannah Kippax on 6 May 1832 at St James’ Church, Pitt Town, New South Wales. I will endeavour to find this record to support this claim, which came from the Howell Identity website that I have previously mentioned, and on which I have checked much of the history and found it to be thorough. In 2013, I collaborated with Nicola Paul who is a descendant of Richard Kippax, and we compared and shared certificates and our research. On one occasion, we met at the State Library of New South Wales to further our research and to access The Bigge Report, this was written by Commissioner Bigge in 1822, who was commissioned by the English Government to write a report on the state of the Colony of New South Wales. Bigge was free to interview convicts and settlers about their experiences, opportunities and views on living in New South Wales. Some Colony officials were sceptical about Bigge to the point of hostility, fearing that his report had the power to close the penal colony, if the report showed lax governance and failure. Governor Macquarie and Commissioner Bigge quarrelled over his interference with his building plan, and the use of the architect Greenway. Bigge labelled Greenways style too embellished and elaborate for a penal colony. 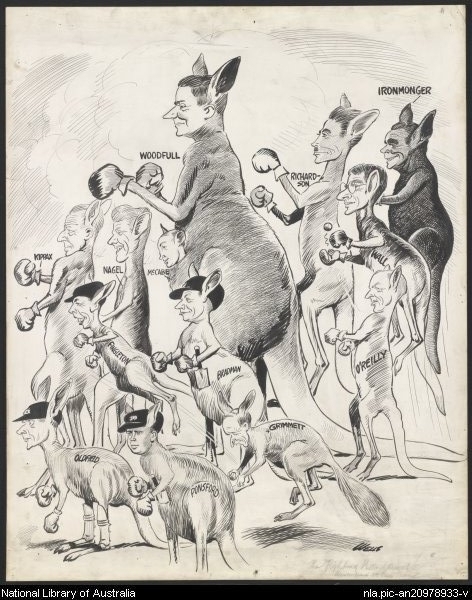 However, to the contrary, Bigge findings, which were presented to the House of Commons in London, were positive about the success of the penal experiment in Australia, and it supported the continuance of the penal colony. 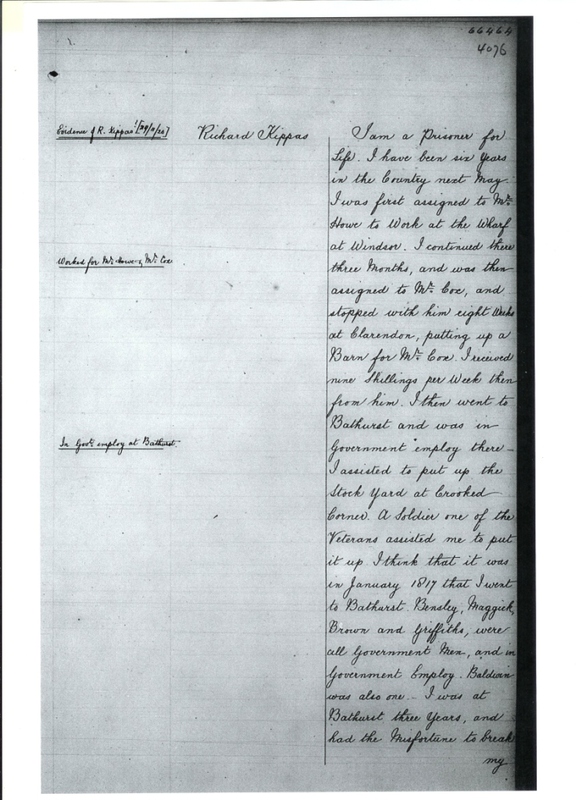 Nicola and I had discovered that Richard Kippax was amongst the convicts that had been interviewed by Bigge and we were eager to access the story. Commissioner Bigge’s work in Australia comprised both inspection and interviews. His style was to use a scribe to record all interviews for later consideration. We are lucky that his thorough investigative style has afforded our family an amazing and historic account of our early ancestor living in Windsor and Bathurst in New South Wales. Even more amazing was his account of an escape with several other convicts in an attempt to flee New South Wales and walk to Java. The fact that they were severely under equipped was an understatement, but the idea that a few hundred miles would find them on the other side of the country was seriously ill informed and totally ignorant about the size of the continent! 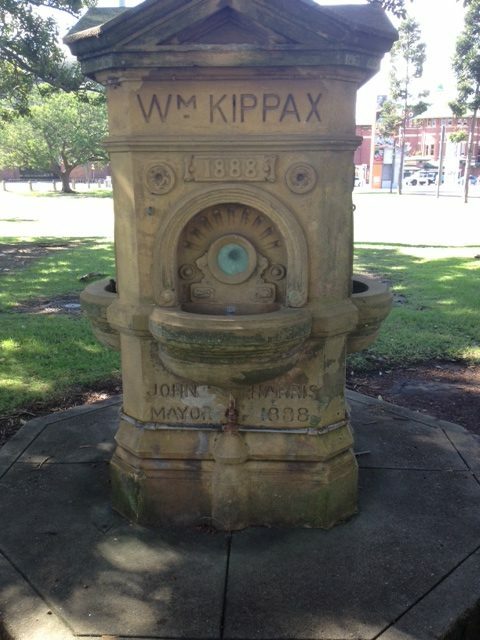 Indeed, Richard Kippax was chosen to become a member of John Oxley’s attempt to cross the Blue Mountains. 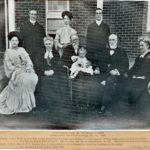 I found an interesting article which gave a wonderful account of Oxley, and was written by a descendant, Gregory Keith Oxley, and called Surveying New South Wales – The Pathfinders. I have included a few excerpts from this document below. “With the land west of the Great Divide opened forever with the crossing of the Blue Mountains, the mystery to be solved was “Where do all the rivers run?” It was thought by many early settlers that the land beyond the Blue Mountains led to an inland sea, or to the western coast, that was possibly only a few hundred miles away. To solve these riddles John Oxley proposed a series of expeditions to follow these inland river systems. 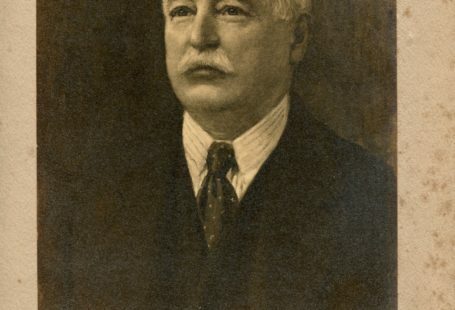 As replacement(s) were required for Hubbard, John Williams, cooper and Henry Shippey, coach builder would have been included to assist John Dwyer. Shippey, a coach builder replaced Kippas, who had a broken leg. Commissioner Bigge, was appointed to conduct an exhaustive investigation, into the Government and life of the Colony. 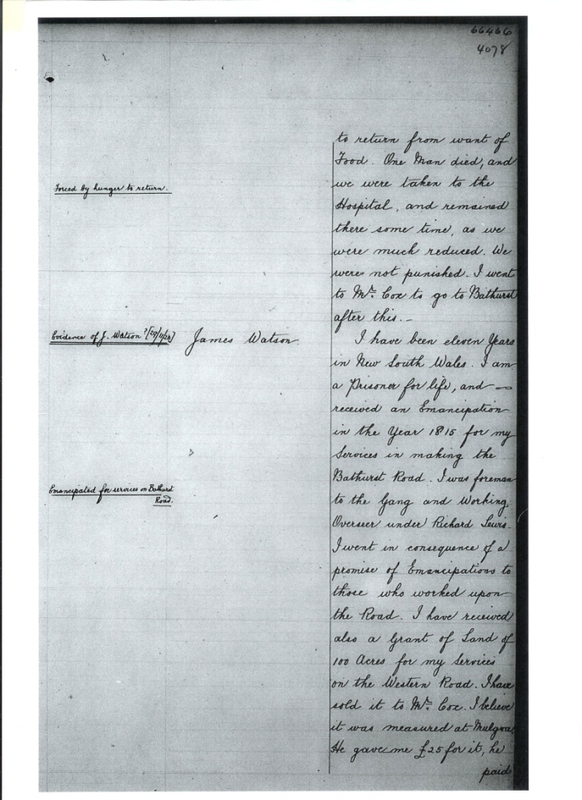 Charles Fraser made a written submission to Commissioner Bigge, accusing William Cox of illegally using Government servants, stock, land and stores for his own use. As a result Commissioner Bigge conducted hearings at Bathurst, during 1820, to hear evidence from convicts and emancipists who had been involved in working for Cox. Those giving evidence included James Blake, Patrick Byrne, and Richard Kippas. Kippas, a rough carpenter, who had been listed to go with Oxley, broke a leg and had to be replaced. Interestingly he gave evidence that 5 months after his arrival aboard the Indefatigable he, and several other convicts escaped to the west of the mountains in an endeavour to reach a Dutch settlement on the west coast of Australia. He claimed they reached a point 150 miles west of Bathurst. This would have been within 20 miles(32kms) of present day Condobolin. One may say it is a most unlikely scenario however why was he chosen to go with Oxley and not confined to the Goal Gang. Lieutenant William Cox arrived in the Colony of New South Wales in 1799 aboard the Minerva, as Paymaster for the Regiment. He bought his wife and four of his six young sons. He lived at Dundas, purchasing Brush Farm from John Macarthur, whom he had succeeded as paymaster. In 1809, he resigned his commission, and retired to civilian pursuits. Later Governor Macquarie made him a magistrate of the Hawkesbury region and he earned a reputation for being a humane magistrate and employer. It was no secret that he incensed Commissioner Bigge with his attitudes. Cox earned several good commissions building for the Governor including gaols, schools and the court house in Windsor built to plans by Francis Greenway in 1820. After the crossing of the Blue Mountains, Macquarie had earlier commissioned Cox in 1814 to build the road over the mountains. It was a lucky day for Richard Kippax that, after his failed escape, he was employed by Cox. 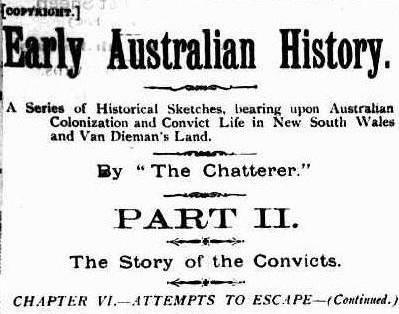 I did find an interesting account in an old newspaper, of this hair brained adventure that nearly cost Richard Kippax his life published in the Bathurst Free Press from 1889, which was running a series on early Australian History, and in Part II there were several accounts of famous convict escapes. 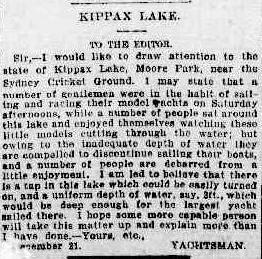 Later, while searching Trove Digitised Newspaper, I found an article from 1815 in the Sydney Gazette about Kippax’s ill-fated journey. Below is an email from Nicola, dated 21 February 2012, who also lent me about a wonderful book she had purchased called Tour to Hell by David Levell which goes someway to explaining why it was that Richard Kippax and his escapees thought they might have reached civilisation just over the Blue Mountains. Thanks for the photos. Your previous email inspired me to go to Rookwood on the hunt but i didn’t look for William Henry because I thought you might already have it. If I get a chance I might go back soon – it is only 20 minutes from Bexley. “Tour To Hell – Convict Australia’s Great Escape Myths” by David Levell from 2008. The book is an account of the early convict years and the “escape myths” held by convicts e.g. 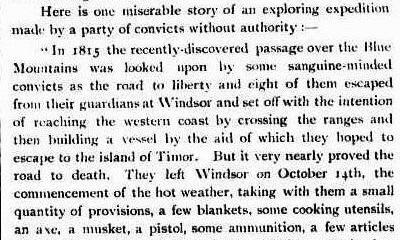 some were convinced that a white civilisation existed in the nearby bush, or that Timor was a short distance overland, presumably because Timor would have been the next port of call after Sydney for many convict vessels. It is very exciting about the UK contact. 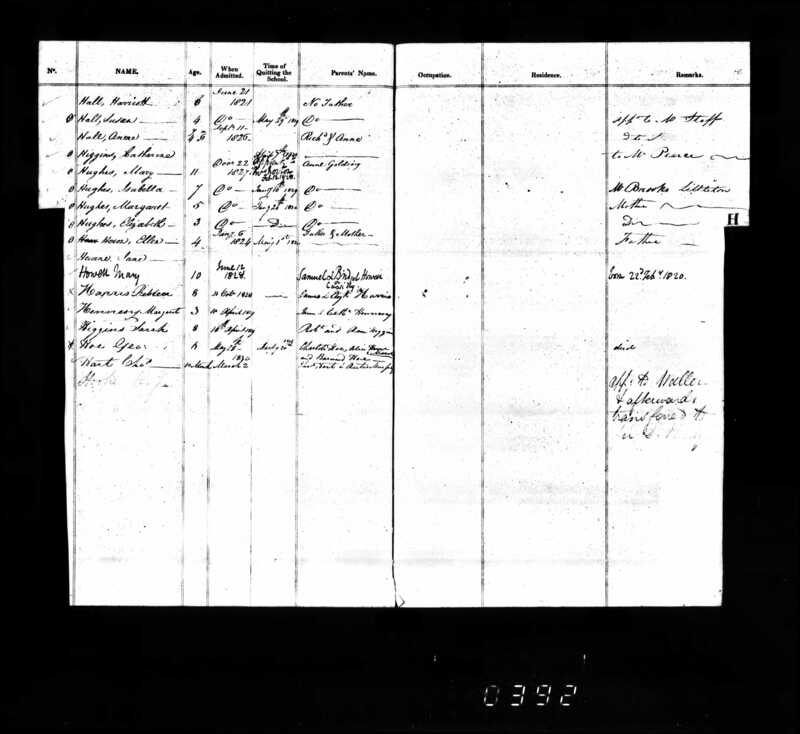 I think it is quite hard to track down the parents of convicts but the National Archives have some records that could help. David Levell in his book Tour to Hell, writes about an even earlier attempted escape by John Ablett, a convict working as William Cox’s groom, who took his master’s dogs for a “walk” one day, intent on walking to Timor, at least a year before Richard Kippax’s disastrous journey. 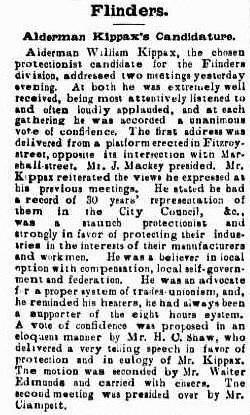 A year later, rather than be punished for this escape bid, Cox pressed for Ablett to be granted a ticket of leave by Governor Macquarie. 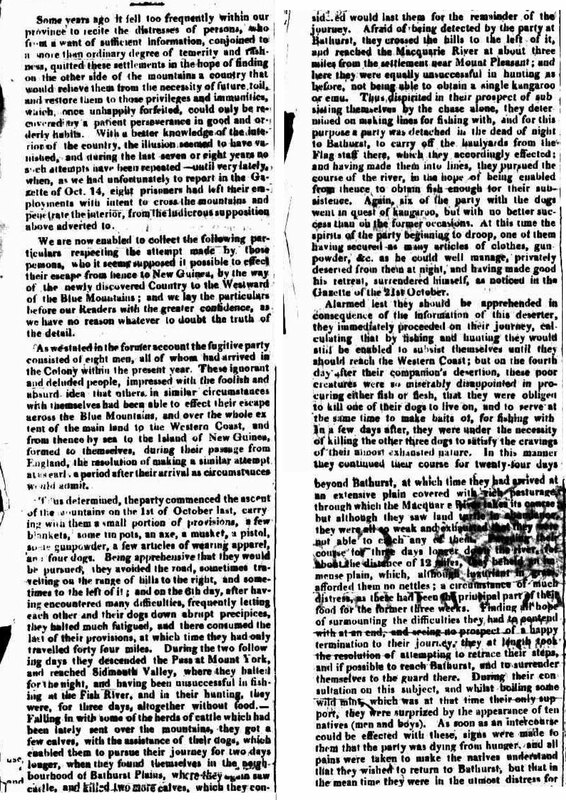 The Sydney Gazette recounts the tale of a fugitive party of eight escapees, and their “chimerical and absurd attempt that gross ignorance almost ever suggested to man.” It may have seemed light hearted, and the convicts may not have been punished due to the appalling state of health that they were in, however, it cost one man his life. Richard Kippax’s good friend John Haigh tragically did not survive the expedition. John Haigh was with Kippax at the Yorkshire Assizes standing side by side during their trials, Richard for highway robbery and John for sheep stealing; both were sentenced to death, later commuted to transportation for life aboard the Indefatigable and then both sent to Windsor. After the death of Richard Kippax in 1839, Hannah, at 45 years of age, quickly forms a relationship with another convict, Philip Thoroughgood. Philip was convicted as a horse stealer, and arrived in the colony of New South Wales in 1828 aboard the Phoenix. Philip and Hannah have four children. Phillip (1840-1903), Mary Ann (1843-1910), George (1846-1894) and Henry (1851-1927). Doing the mathematics on these children, it places Hannah as a plus fifty-year-old woman still having children, and I hesitated to collect these records at first. While not disputing the births of these children, I can’t help wondering about the correctness of her birth date, and question the age details given at her death. Given that Ann Germaine was Samuel’s partner up until about 1805, I have seen other researchers have placed Hannah’s birth as late as 1803. In much the same way that I discovered that my ancestor Richard Kippax was a convict, I literally stumbled across this post in ancestry, as soon as I added Samuel Howell into my ancestry.com tree as the father of Hannah Howell. 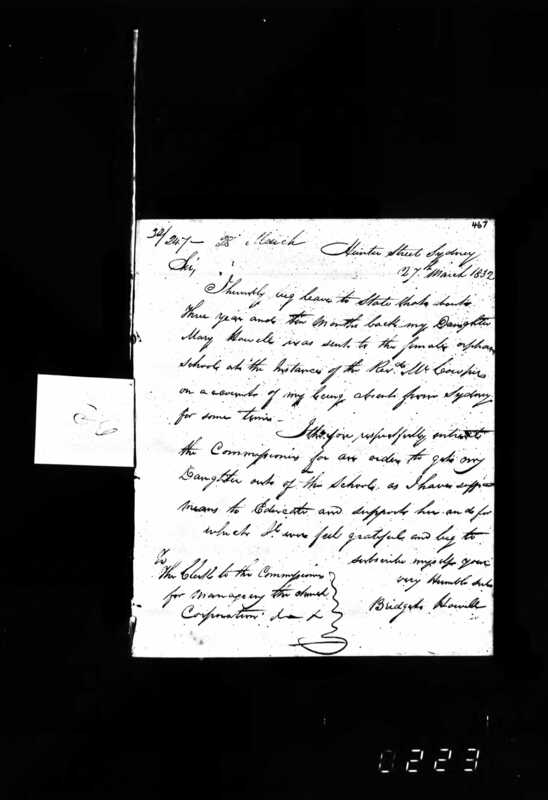 “Samuel Howell was sentenced to death at the 5 March 1789 Winchester (Hampshire) Assizes with Mary Jones (qv) and Joseph England (who was pardoned in April) for burglary on 21 August 1788 of the house of Elizabeth Gearle, widow (since deceased) at Over Wallap. A large quantity of clothing and 96 halfpence had been stolen. Howell was reprieved to transportation for life the following month and was sent on board the Portsmouth hulk Lion on 7 August 1789, age given as 16. He was embarked on the Scarborough, transported on 29 November 1789. 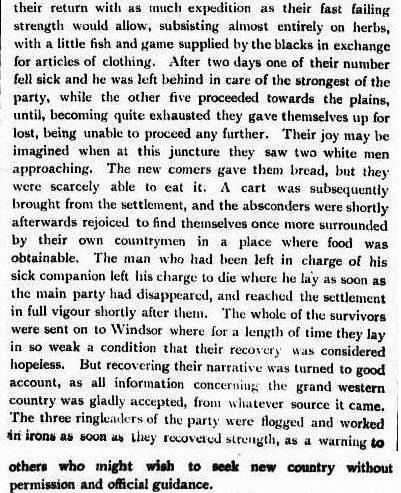 An online website called Australian Royalty.net.au (link provided previously) was a wonderful source of information about Samuel Howell and placed there was an excerpt from an English Newspaper in 1789. “On Thursday the Assizes for this County began at the Castle of this City, before Sir William Henry Ashhurst, Knt. and the Honourable Francis Buller, Esq. when the eight following prisoners received judgment of DEATH, viz. William Dungan, alias Quin, charged with feloniously and burglariously breaking and entering the house of George Monro, in the Neighbourhood of Havant, in this County, and stealing divers articles of plate, and other things, his property. mary Jones, Samuel Howell, and Joseph England, charged on a violent suspicion of feloniously and burglariously breaking and entering the dwelling house of Elizabeth Gentle, in the Parish of Wallop, in this County, and stealing divers sorts of apparel and other things, her property. ..
Scarborough was a transport ship of 430 tons, built at Scarborough, Yorkshire in 1782. She formed part of the First Fleet, which commenced European settlement of Australia in 1788. Her master was John Marshall, and the surgeon was Dennis Considen. She left Portsmouth on 13 May 1787, carrying 208 male convicts, and arrived at Port Jackson, Sydney, Australia, on 26 January 1788. 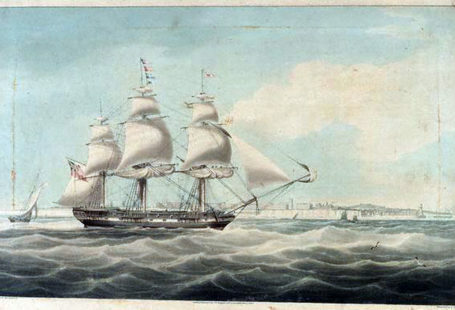 On leaving Port Jackson on 5 May 1788, in company with the Lady Penrhyn, she travelled to China. 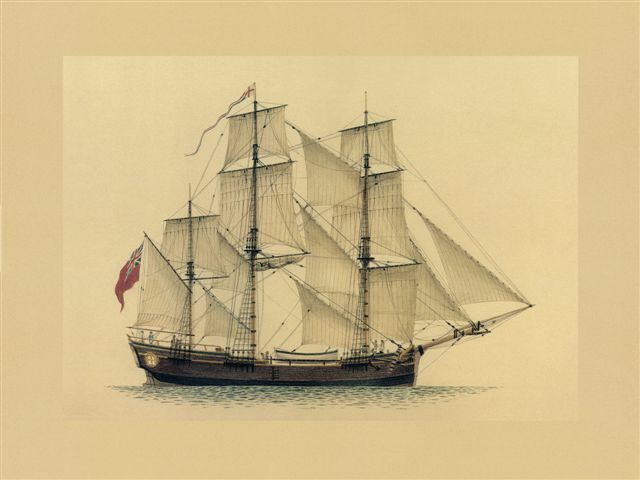 On 17 May 1788, she landed at Lord Howe Island for birds and vegetables, and arrived in England on 15 June 1789.She returned to New South Wales with the notorious Second Fleet. In company with Surprize and Neptune she sailed from England with 253 male convicts on 19 January 1790. Her master was again John Marshall and the surgeon was Augustus Jacob Beyer. She arrived at the Cape of Good Hope on 13 April 1790, and spent 16 days there, taking on provisions, and 8 male convicts from HMS Guardian, which had been wrecked after striking an iceberg. She and Neptune parted from Surprize in heavy weather and arrived at Port Jackson on 28 June, 160 days out from England. During the voyage 73 convicts died (28%) and 96 (37%) were sick when landed. Dennis Considen (died 1815) was an Irish-born surgeon, best known for his pioneering role in the use of Australian native plants for pharmaceutical use, especially eucalyptus oil, which he used to treat the convicts. He sailed with the First Fleet as surgeon on the Scarborough which transported English convicts to Port Jackson, Australia, in 1788. I did some reading into the Second Fleet and discovered that the treatment of the convicts was vastly different to that of the First Fleet. The Second Fleet comprised six ships, Guardian, Justinian, Lady Juliana (which sailed earlier), Surprize, Neptune and Scarborough. “Lady Juliana arrived June 3, 1790, was found to carry not food but female convicts, mainly elderly and infirm. Justinian, arrived June 20, brought food and news that the principal store ship, Guardian, had founded off the Cape of Good Hope. His Excellency, Governor Phillip has severely censured the commanders of the transports and ordered all bodies to be buried on the north shore. The sick has been accommodated in hospital and in emergency hospital tents. 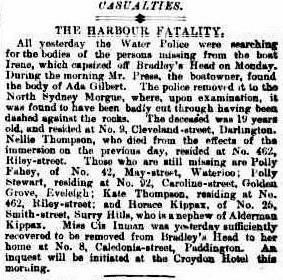 There are 488 persons receiving attention: 267 are reported dead on the voyage.” Cheryl Timbury, 25 January 2016 Newsletter, First Fleet Fellowship, Victoria Inc.
From what I could glean from my research, the contractors for the Second Fleet were paid in London per head, and didn’t really worry too much about how many convicts actually arrived in Sydney, or if they were well looked after. It turns out that the contractors had been employed previously, bringing cargoes of slaves from Africa to America, and after the English lost the American War of Independence, this previously lucrative business tailed off. It is a shocking reflection on their past treatment towards African slaves, and the conditions under which they must have suffered. Captain Arthur Philip was apparently crestfallen when he discovered the state of the convicts aboard the Second Fleet, not only had the Colony nearly starved to death due to lack of provisions and crop failure, they now had hundreds of convicts to recuperate under dire circumstances. I can only lament that my ancestor Samuel Howell committed his felony a year too late to be included in the First Fleet, however, my admiration and appreciation of Samuel is enormous. He was obviously a survivor, and while his relationships to his wife Ann Germaine, and later to his partner Bridget Carty ended in failure, the Census showed him caring and providing for his family as best he could. He must have been grateful that, at the age of 16, he was given a new chance, in a new country with the opportunity to turn his life around. It was a fascinating research experience for me to find each record for the Howells, as well as searching Trove digitised newspapers to find small advertisements and articles placed into local newspapers about their lives. 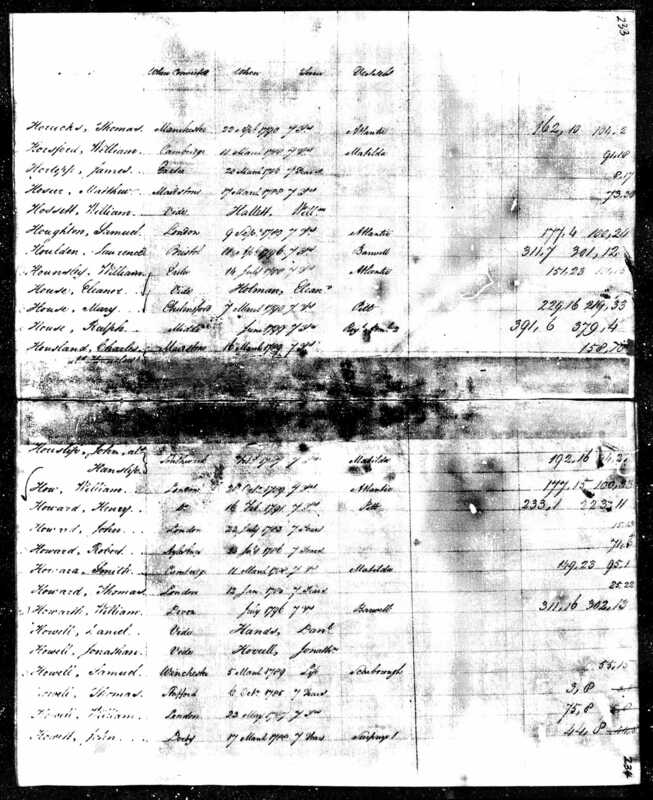 In collecting Census Records, Convict Indents, Gaol Deliveries, Coronial Enquiries and Orphanage Records for Samuel Howell’s family I was taken back in time to view their complex lives, and their struggles to survive in the harsh penal colony of New South Wales. Samuel’s trial is listed as Winchester and the boat he sailed on was the Scarborough. This record gives Samuel’s date of trial as 5 March 1789, and lists his sentence as life. 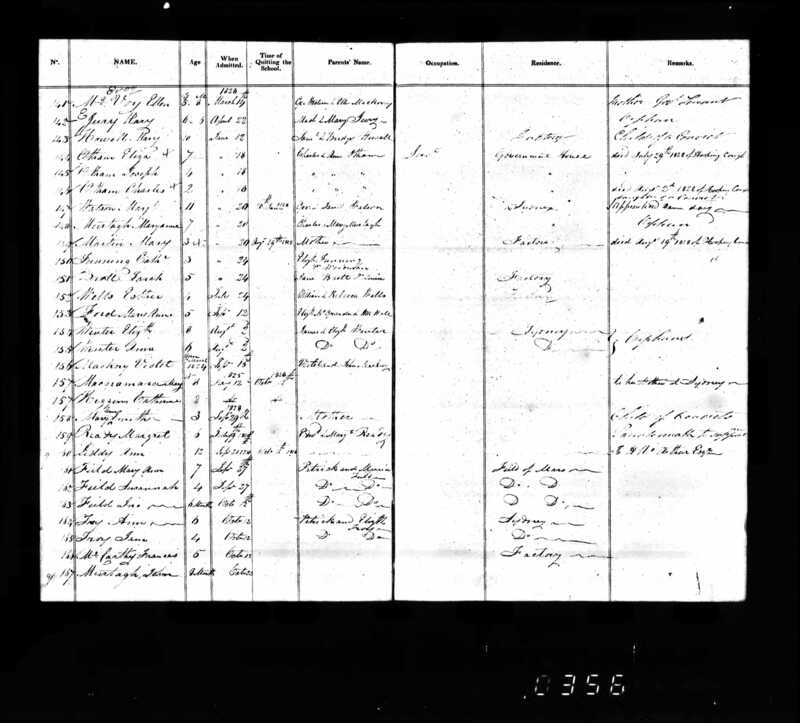 I consider this record below to be Samuel Howell’s marriage record to Ann Jarmy and I think I was the first researcher to find and publish this fact. Ann Jarmy (sic), Bishop Thompson and Charles Barwick were committed for the same crime at the Norwich Assizes on 26 July 1790, and convicted for 7 years and transported on the Mary Ann, and part of the Third Fleet in 1791. Samuel Howell and Ann Jarmy married in 1797, they already have three children, Henry Howell (1794-1831), Hannah Howell (1795-1871) and Maria Howell (1796-18161). 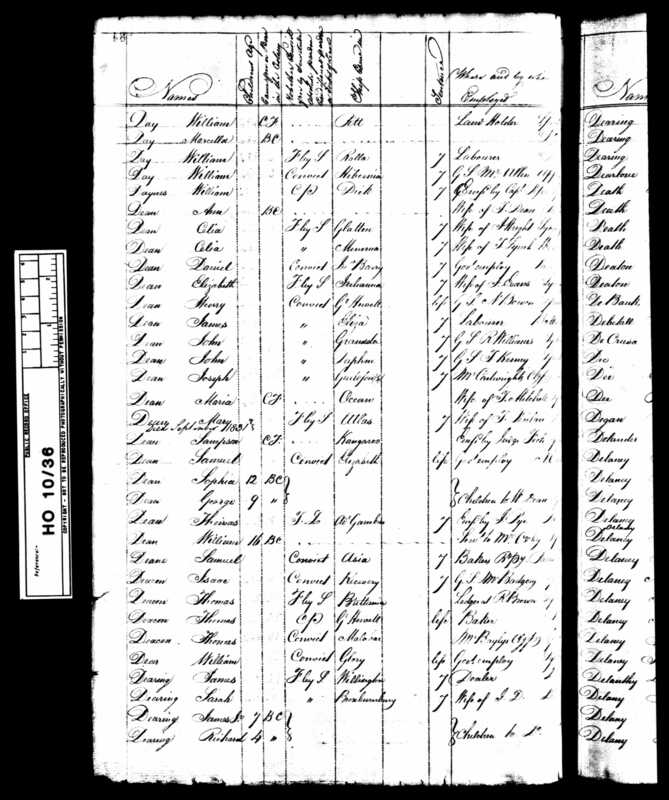 Henry Howell married Mary Harriet Hill on 3 April 1815 and they have eight children, Ann 1816, Sarah 1818, William 1820, Ann 1820, George 1823, Harriet 1824, David 1827 and Alexander, 1830. 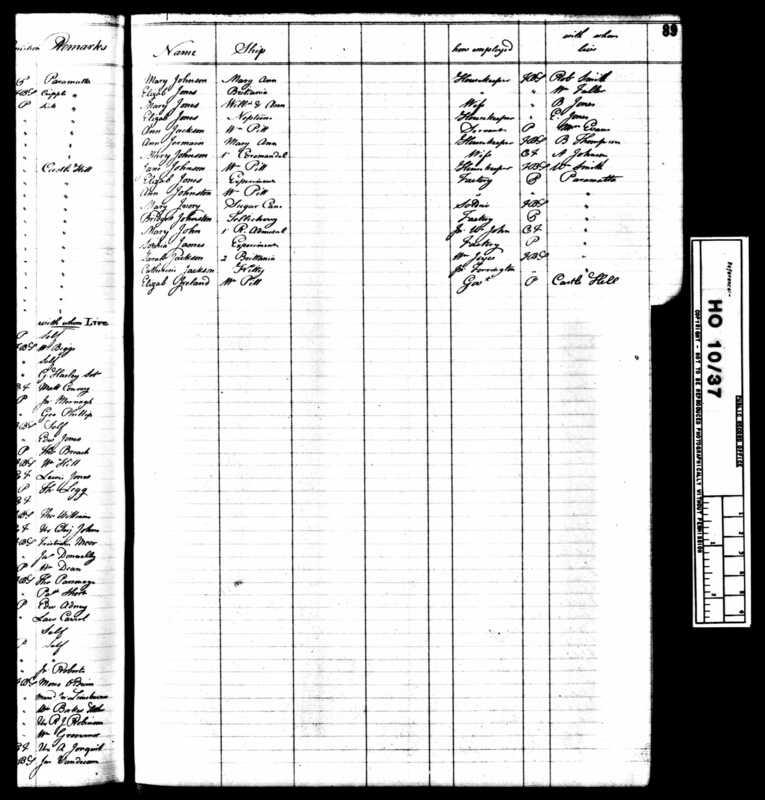 Henry Howell, housekeeper, his wife Mary, and children Ann 4, Sarah 7 and George 2 years all appear on the New South Wales and Tasmania Convict Muster (1806-1849) for 1825 along with Henry’s father Samuel Howell listed lower down with his family. Recently I was corresponding with another researcher, Mary Petroff who had assisted me with some old photographs taken by an early Sydney photographer and historian Mrs A.G. Foster in 1901 of Devonshire Cemetery. Her husband Arthur George Foster was also an historian who transcribed very accurately many of the headstones at Devonshire Cemetery in 1901. 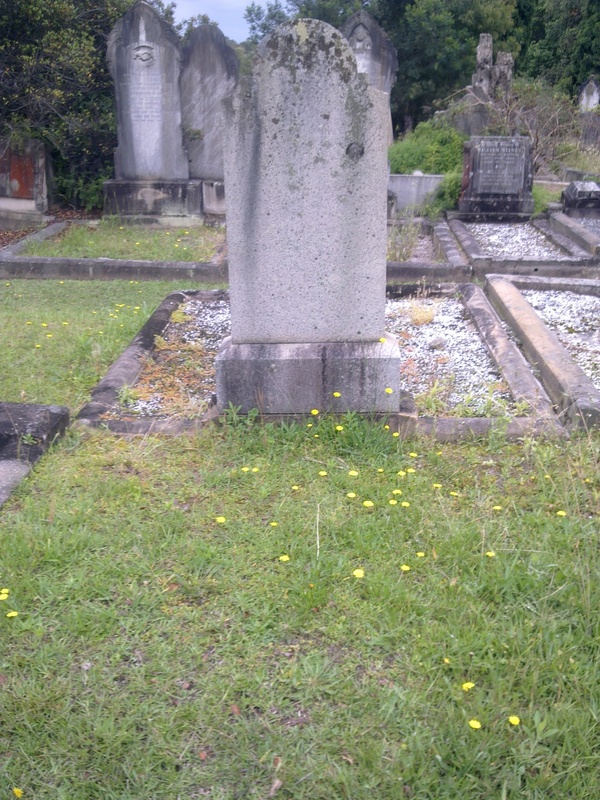 The Fosters devoted all their spare time in 1901 to the task of recording the headstones, knowing that the cemetery was soon to be razed and the site was to be converted into what is now known as Sydney’s Central Railway. 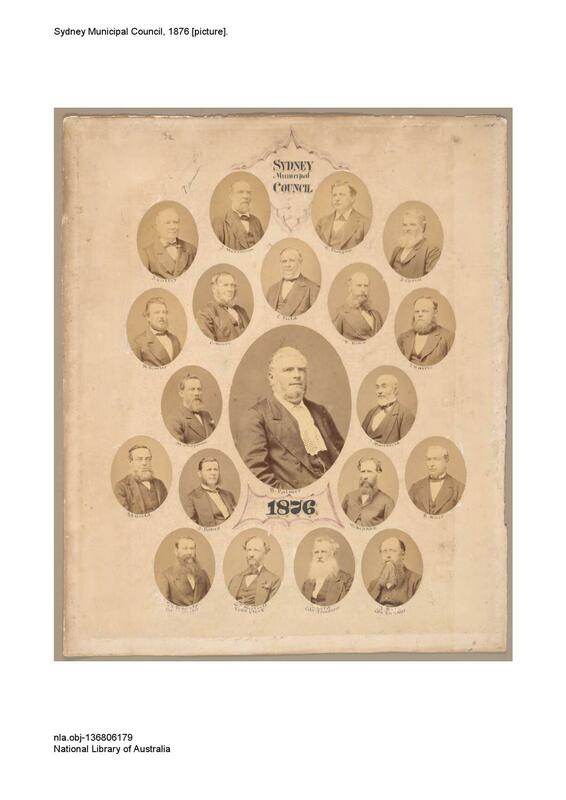 The State Library of New South Wales is the place where this precious collection is housed but at the moment the only way to find the image you require is to trawl through each image one by one. However the results are absolutely so exciting. 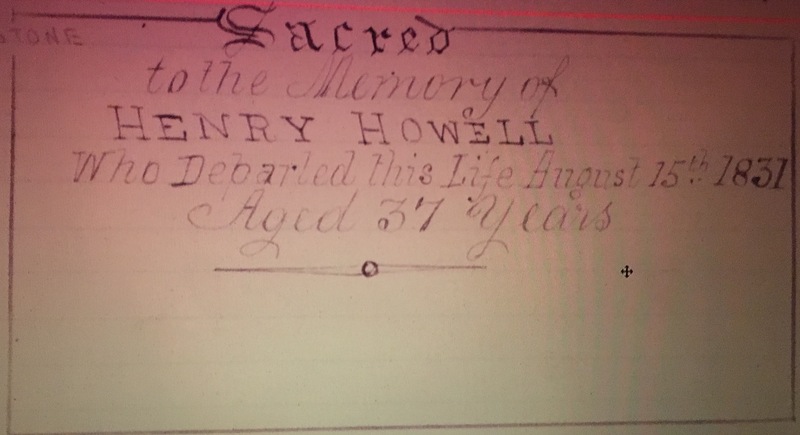 Whilst searching for another family record I came across this wonderful record for Henry Howell. 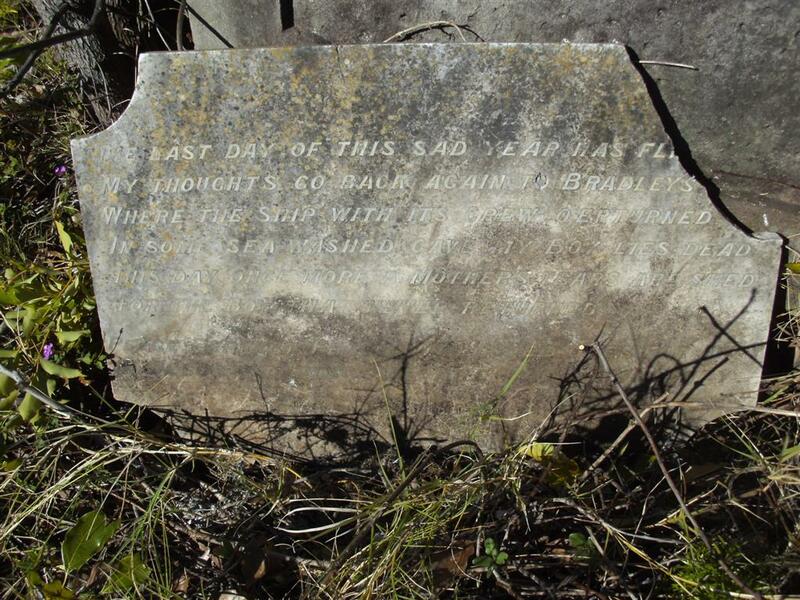 Henry’s headstone was amongst a large number that were removed to Bunnerong Cemetery, however, after another relocation to Botany Pioneer Cemetery his headstone did not survive the second re-location. 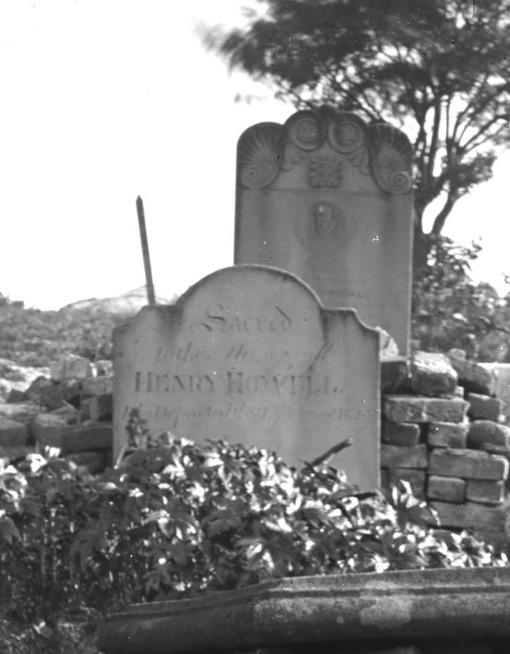 Henry Howell was buried in a large group of graves associated with his wife Mary Harriet Hill’s family. As a matter of incredible luck I spied the name Henry Howell in the background of one of Mrs Foster’s many photographs of Devonshire Cemetery. I am sure this very early, historic and precious photograph is the only one the family has for Henry Howell burial. Hannah Howell, whom I have previously dealt with. Maria Howell married William Bruce in 1815 and had five sons, Edward 1819, William 1821, James 1823, George, 1825 and Richard 1827. 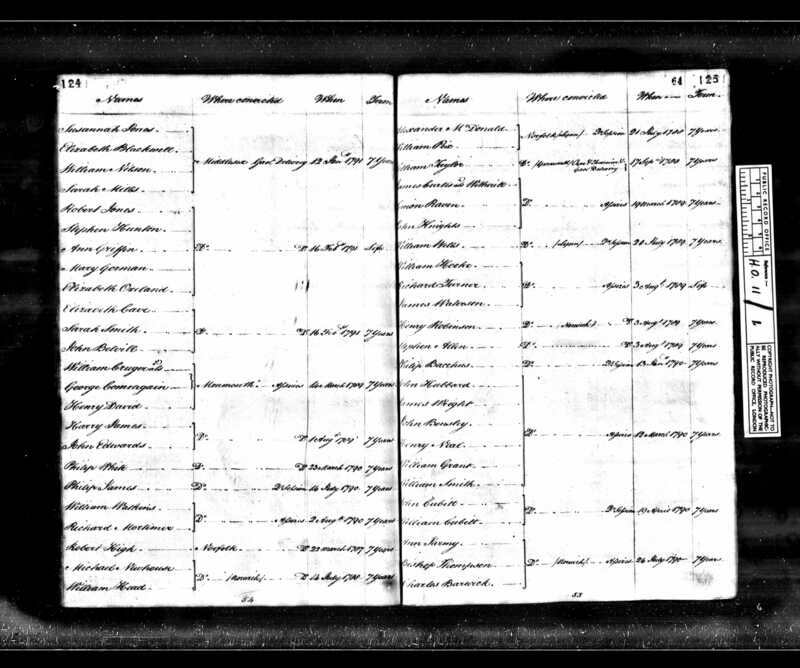 The 1828 New South Wales Australia Census shows Samuel Howell actually working with William Bruce in Sydney. 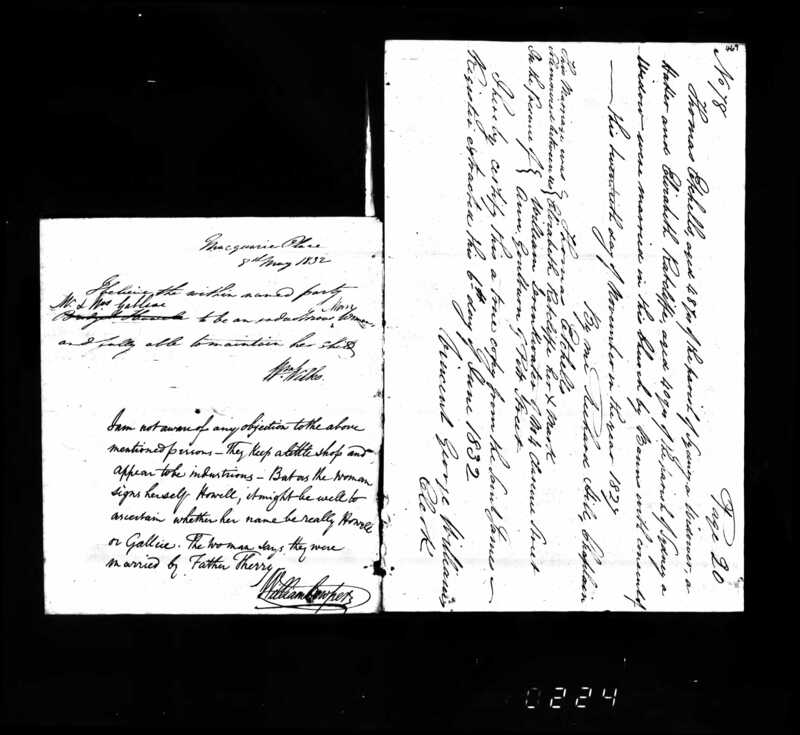 It is evident that the marriage of Samuel Howell and Ann Germaine/Jarmy had broken down in 1805 and Ann was apparently now living with Bishop Thompson, who was tried at Norwich Asssizes on the same day as Ann, and also was transported on the Third Fleet. This obvious former association, whether by necessity or desire, Ann had taken up with Bishop Thompson. Ann Germain can clearly be seen from this General Muster as housekeeper to B Thompson. 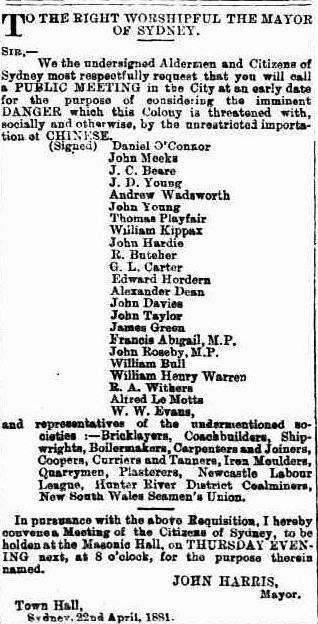 The wonderful part of these musters is the continual listing of each convict and the ship that they were transported on. Ann Germain was transported on the Mary Ann, a ship from the Third Fleet. Ann Germain and Bishop Thompson had two children, Charles (1805-1811) and Sophia Bishop (1808-). 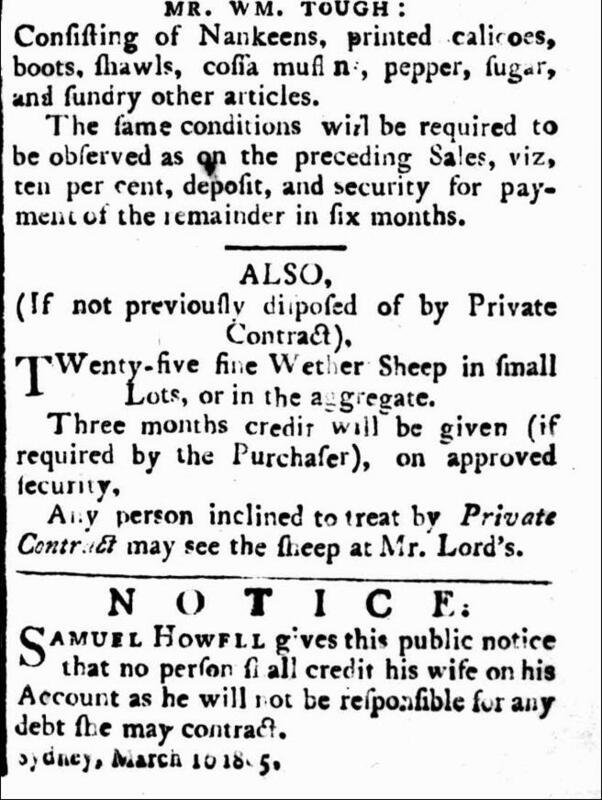 I would suggest from the date of Charles’ birth, this could well have been the reason for Samuel placing the Public Notice in the Sydney Gazette in March 1805, stating he was not responsible for his wife’s debts. 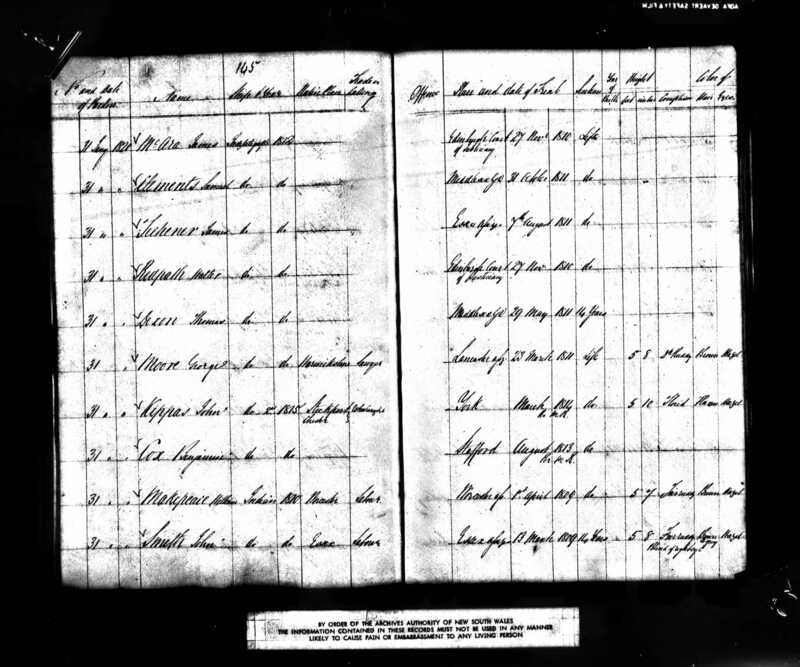 Ann Germain also had a relationship with James Eager and she had a child Diana (1820) who was listed on the NSW Census for 1824 and sadly Ann is listed as having died the year before. I was then able to confidently collect Ann Howell’s death record showing that Ann died in Windsor in 1823. 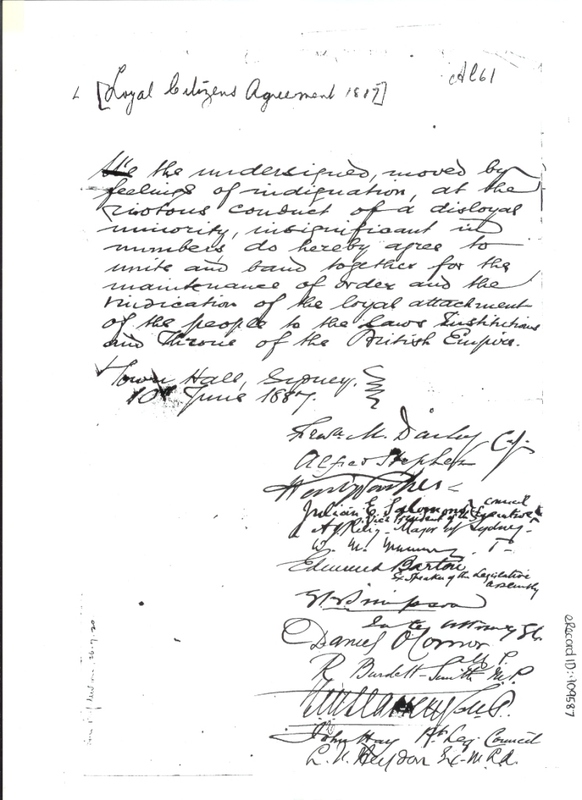 This record notes that Samuel Howell has a large family and he is sponsored by D. Wentworth. 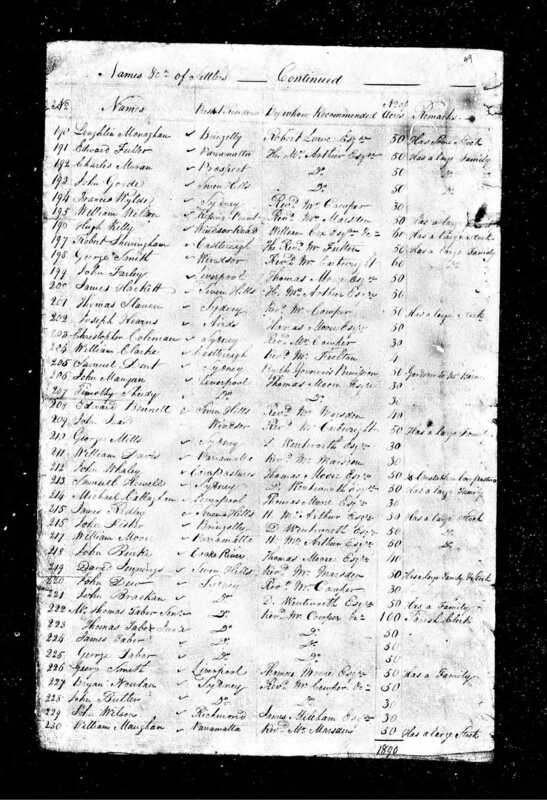 The 1822 Muster lists Samuel Howell and three of his children from his second marriage to Bridget Carty, Mary 5, Samuel 3 and John 1, and Henry Howell, baker, Samuel’s son from his first marriage to Ann Germain, together with Henry’s wife Mary Howell nee Hill and their three young children, Mary 5, Samuel 3 and John 1 year. 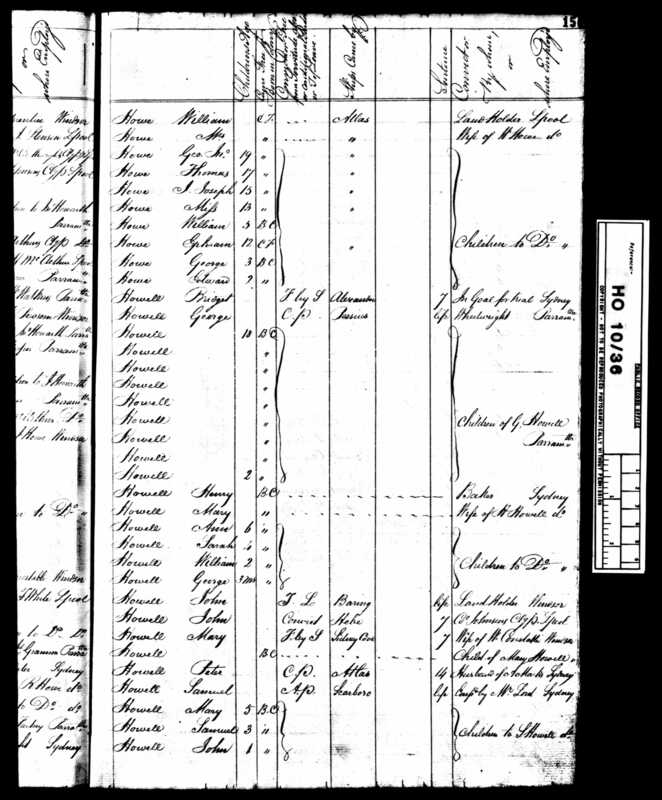 I later discovered that the reason Bridget did not appear on this 1822 census was because she was in gaol as an accessory to the Bradley murder, which was well covered in the newspapers. Bridget Carty was transported for 7 years in 1815 aboard the Alexander. 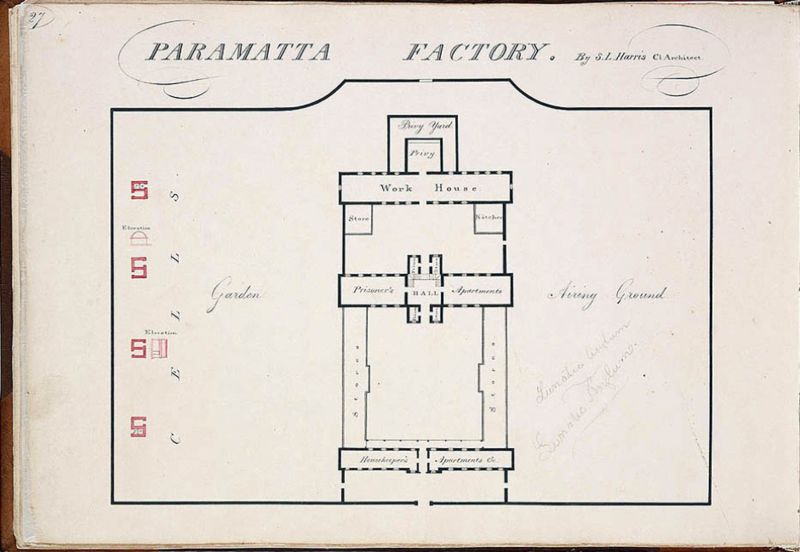 Bridget Howell is admitted to Parramatta Women’s Gaol otherwise known as Parramatta Women’s Factory in 1822, listed as a convict transported on the Alexander. 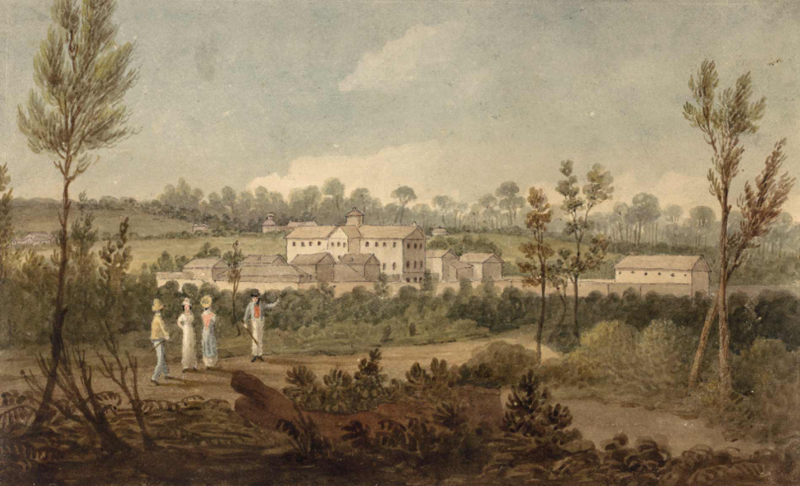 Bridget Howell was sent to Gaol at the Parramatta Factory for the second time in 1828 for receiving stolen property, and according to the Howell Genealogy, an online website which thoroughly accounts for Samuel Howell’s large and dysfunctional family. 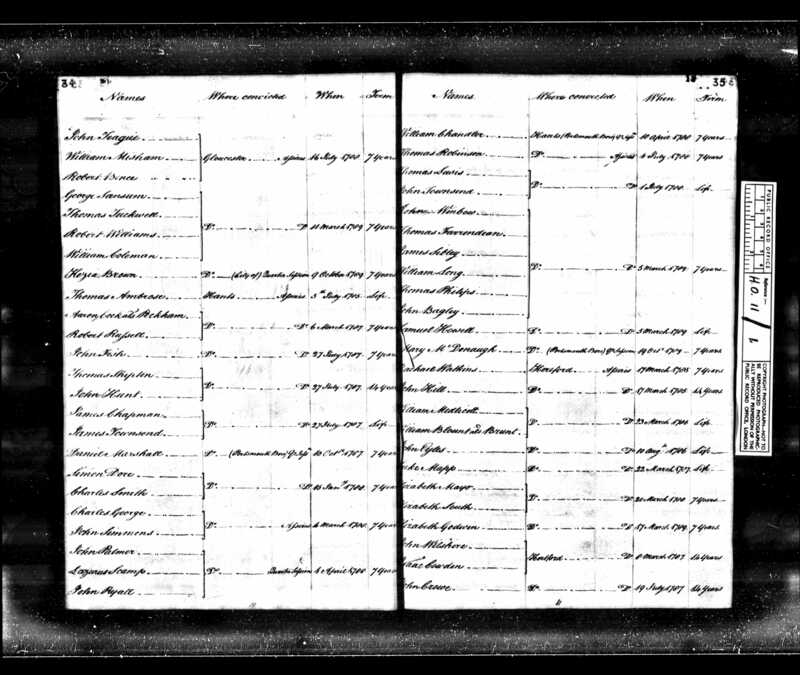 1828 Census for Parramatta Women’s Factory listing Bridget Howell, aged 39, convict of the Alexander, 1813, transported for 7 years. 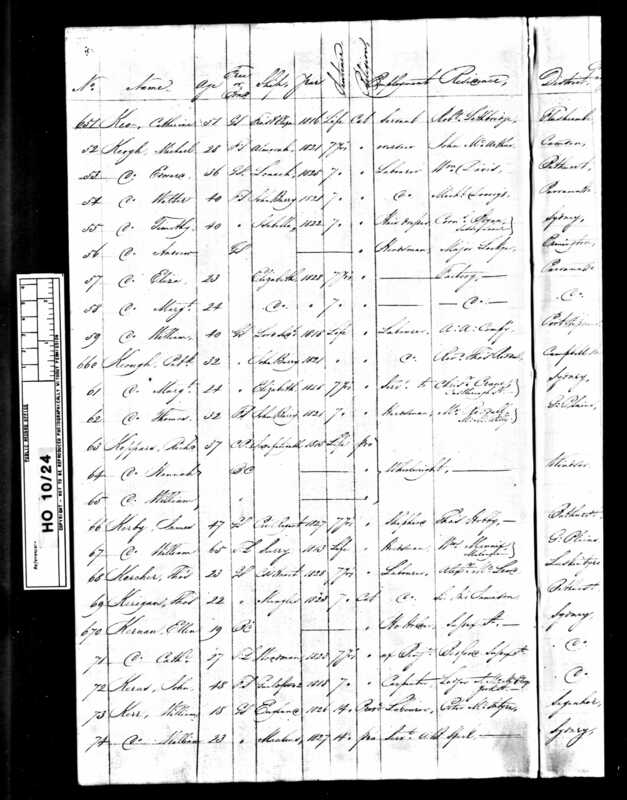 Mary Ann Howell’s parents are listed as Samuel and Bridget Howell on this 1828 record. Interestingly Bridget is also known as Cassidy on this record. 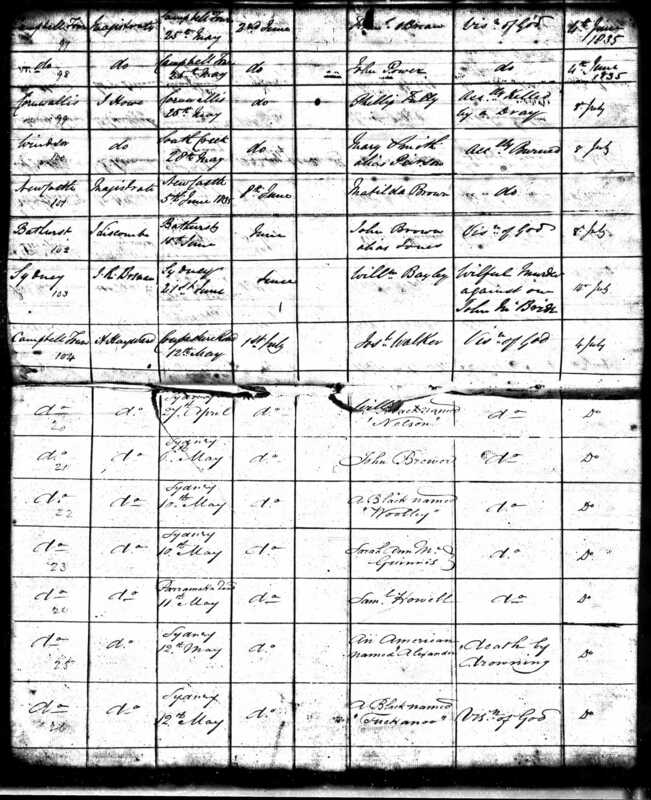 Mary, aged 10, was admitted on 12 June 1828 and on the far-right hand side of the record admission Mary Ann’s date of birth is given as 22 Feb 1820. 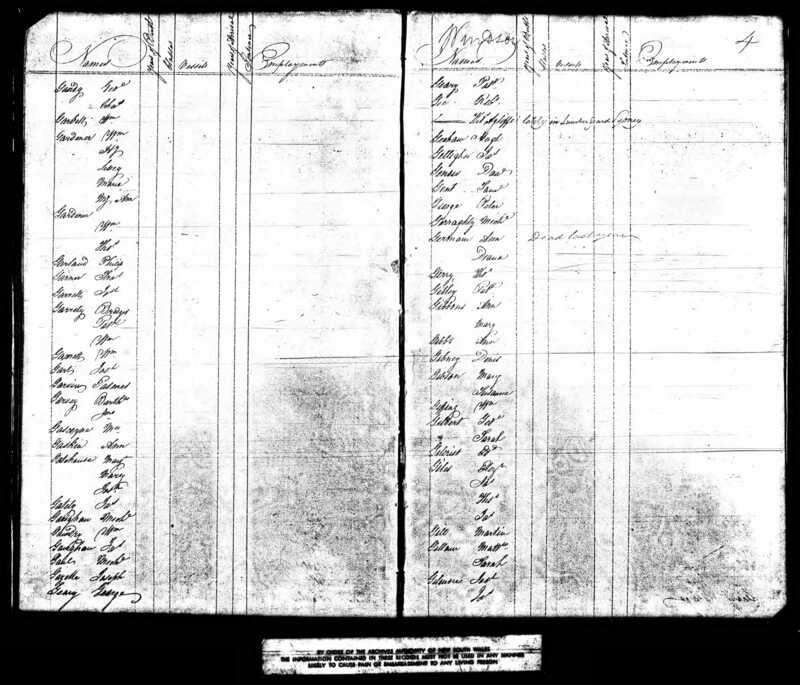 It is again recorded that Mary Howell, aged 10, was admitted to Orphans School on 12 June 1828 and lists her parents as Samuel and Bridget Howell, and Bridget’s address is given as “Factory”, and Mary is listed as a child of a convict. The next records I capture are when Bridget makes an application by letter for Mary’s removal from The Female’s Orphans School. It would seem that a change in circumstance was behind the application letters for the removal of Mary Ann Howell from Orphans School. Although Bridget signs her name to the letter as Bridget Howell it seems that Bridget has been married by Father Therry to Mr Gallice, and together they are industriously running a shop. It would appear that Bridget has reformed her ways and she is to be given a second chance as the mother of Bridget. It is nice to know that Bridget was earnest in her pleading letter for Mary Ann to be released from the orphanage. 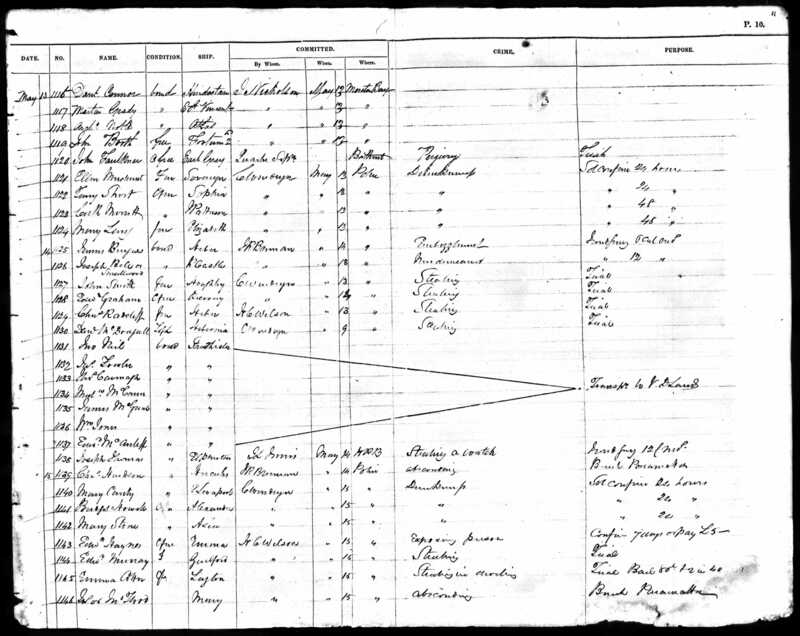 This census I had previously collected for Samuel Howell of the Scarborough, and as I mentioned earlier, Samuel, a blacksmith was working for his son-in-law Mr McGrath of Pitt Street. 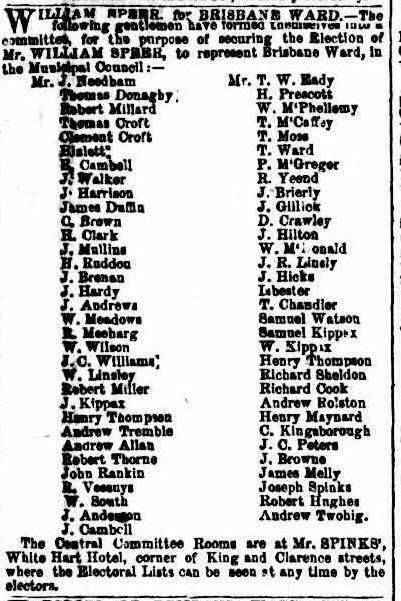 I also noticed that the son of Samuel and Bridget Carty, also called Samuel, aged 8, listed as BC (Born Colony), was living with Andrew Gillis of Hunter Street, Sydney. After collecting the record for Mary Howell’s release from Orphans School, the name Gallice seemed to me to suggest that this was possibly the same man mentioned in both records. 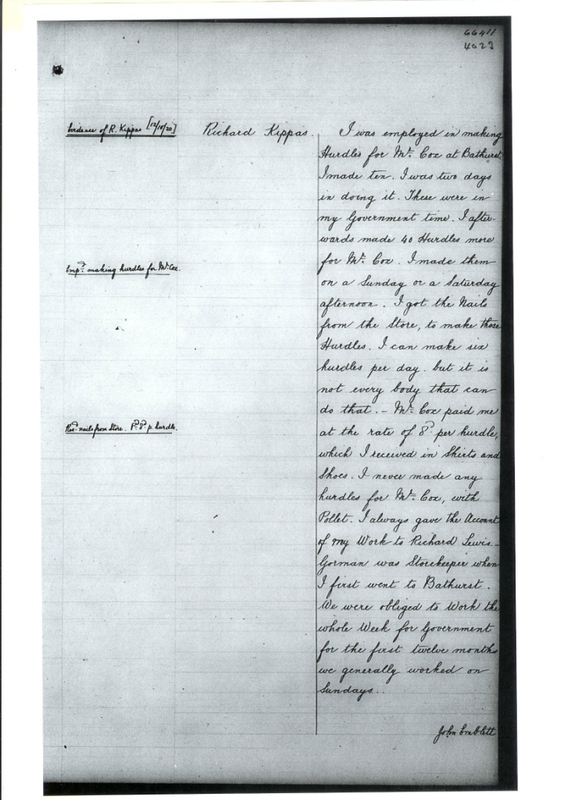 While Bridget was in gaol, Andrew Gillis was looking after Samuel and Bridget’s son. I then determined to further challenge this jigsaw puzzle by trying to find Andrew’s 1828 Census and find out his occupation, and that would possibly be the Gallette’s shop referred to in Bridget’s plea letter. Andrew is listed as a 30-year-old dealer, living in Hunter Street, who arrived in New South Wales aboard the Isabella 2 in 1820, transported for 7 years. 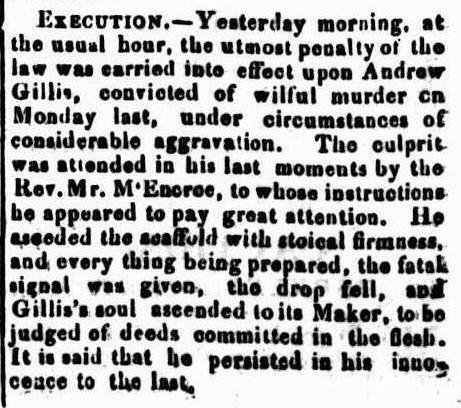 I became interested in Andrew and further research on Trove Digitised Newspapers I found that Andrew sold up in Sydney in 1835, moved to the country, killed a man and was executed for his crime in 1837. An astonishing, but possibly not surprising culmination to my research of this very dysfunctional family group. This record confirmed that indeed it was Andrew Gillis of the Isabella 2 who was executed in 1837. 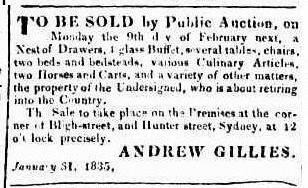 I am sure that Bridget’s relationship with Andrew Gillis had ended several years earlier because I picked up a newspaper clipping advertising the sale of the contents of Gillis shop on Cnr Bligh and Hunter Streets, stating that he was preparing to retire into the country. This record for Bridget Howell of the Alexander is dated 15 May 1839 showing her arrest on account of drunkenness. This is a sad final record for Bridget, and I can’t find a death record for her at this stage. It is hoped that she was looked after by her daughter Mary Ann, who seemed to be her only surviving child. Samuel Howell’s death record, burial transcription and Coroner’s report show that Samuel, a blacksmith, died at Parramatta Road, Sydney on 11 May 1834, and the cause of death was recorded as “a visitation of God”. Samuel was 66 years old. His parents were not listed on this death record, it is possible that we will never know confidently the names of his parents, but it is certain that his crime took place near Winchester, England, as he was tried at the Winchester Assizes. Presumably he lived in this area before his crime. 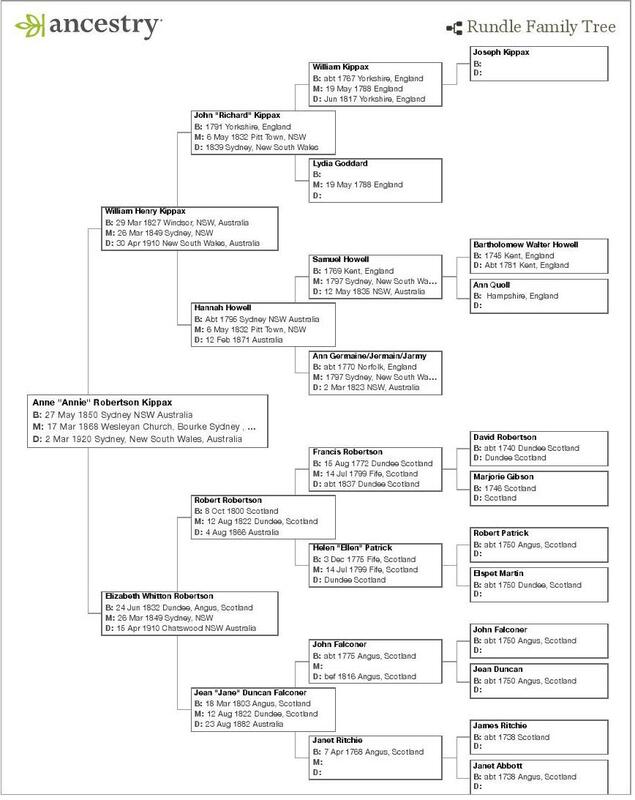 Some ancestry.com trees list his parents as Bartholomew Walter Howell and Ann Quoll, of Kent, England. For now, this is where I finish my chapter on the Kippax and Howell Families. 2016 Newsletter, First Fleet Fellowship, Victoria Inc.
Ken Robson was my Uncle…he was very passionate about our family tree for many of my growing up years. He was very close to my Father who was his older brother. It was me that contacted your mother when he died in 1987. I am sorry to here that your own mother died at the beginning of last year. He often spoke well of her. I looked after Ken almost to his death in my home. I do believe his original family trees and other personal effects are located in the Wollongong Council Library. In good Robson tradition I had two wonderful sons and a daughter yielding 14 grandchildren. Sadly we lost number two son to a road accident in 2013 leaving behind a wife and 7 children. Our oldest son Andrew is an Anglican Minister and knows a lot of the Robson history as I computerise most of what Ken produced in the earlier days. How wonderful to hear from you after all this time. I knew Ken well. He visited our home several times and offered my mother great sympathy at a time when she was so sad after my dear father died. We visited Ken in Paddington just before his death. My sister has a copy of Ken’s Robson Family History, written at a time before the internet. It was an amazing document. I had my DNA done a few years back for the Kilpatrick project on my dad’s mother’s side, with no results. However I left my DNA on the site and just last month I had confirmation finally about the Veitch family. Not your side though. So it does work! How kind of you to contact mum, I do appreciate this. Dearest mum was 94 and lived a full and wonderful life. I will go to Wollongong Library where they have a lot of info and photo albums as well. So pleased you have continued the Robson line. Ken would be so happy! His work was amazing. If you ever come to Sydney, please look me up, as my sister and I would be so pleased to meet you. Very much appreciate this information-laden resource. My name is Phillip Hazleton. I am the eldest son of Leila Warren Kippax, daughter of Arthur Craigie Kippax who is the brother of Alan Kippax and Roy Kippax. A fantastic resource, extremely well researched and set out. I have only come across your material recently, but it has been a wonderful help in breaking down some brick walls. Especially in relation to the Faughtley / Wright nomenclature. It revealed my 4th Great Aunt, Esther Elizabeth Onions, was buried as a ‘Wright’ not a ‘Faughtley’. She had married George Faughtley in 1835, but subsequently he was known as George Robert Faughtley Wright. Hey presto…. I had found her.